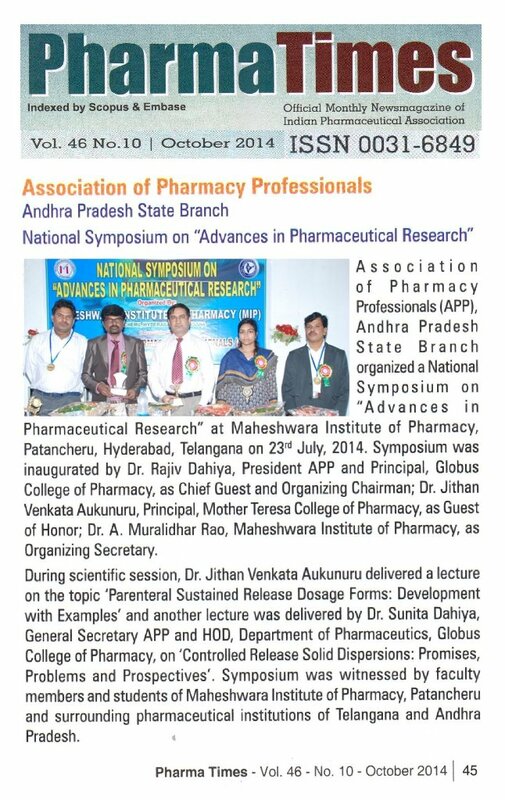 Association of Pharmacy Professionals (APP) Andhra Pradesh State Branch organized a National Symposium on “Advances in Pharmaceutical Research” at Maheshwara Institute of Pharmacy, Patancheru, Hyderabad, Telangana on 23rd July, 2014. 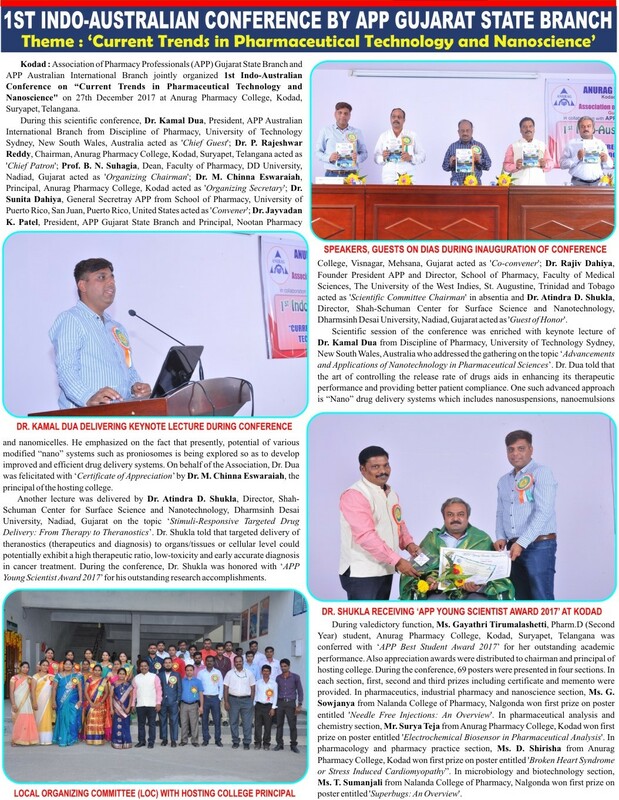 Symposium was inaugurated by Dr. Rajiv Dahiya, President APP and Principal, Globus College of Pharmacy, Bangrasia, Bhojpur Road, Bhopal, Madhya Pradesh as Chief Guest and Organizing Chairman; Dr. Jithan Venkata Aukunuru, Principal, Mother Teresa College of Pharmacy, Rangareddy, Telangana as Guest of Honor; Dr. A. Muralidhar Rao, Maheshwara Institute of Pharmacy, Patancheru, Hyderabad, Telangana as Organizing Secretary. During scientific session, Dr. Jithan Venkata Aukunuru delivered a lecture on the topic ‘Parenteral Sustained Release Dosage Forms: Development with Examples’. Dr. Aukunuru explained the fundamental requirements of sustained release parenteral dosage forms and their potential over oral sustained release dosage forms. He discussed how sustained release parenteral dosage forms including neosomes, liposomes, nanoparticles and others can be developed and what is their current status in the pharmaceutical market. He detailed the gathering about development of commercial products of sustained release parenteral dosage forms with specific marketed brand examples. Dr. Jithan also highlighted salient features of implants and recent innovations in the field of parenteral sustained release dosage forms during his address. Another lecture was delivered by Dr. Sunita Dahiya, General Secretary APP and HOD, Department of Pharmaceutics, Globus College of Pharmacy, Bhopal, Madhya Pradesh who addressed the gathering on ‘Controlled Release Solid Dispersions: Promises, Problems and Prospectives’. 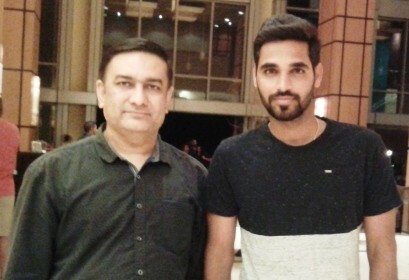 Dr. Dahiya focused on various aspects of controlled release solid dispersions such as its background and promises, carriers used, preparation methods, evaluation parameters as well as mechanism of drug release. She also discussed the problem areas and reasons of limited commercialization of such products. Dr. Dahiya also highlighted recent strategies to overcome such problem areas as well as future prospectives in the field of controlled release solid dispersions. During the event, APP Telangana State Branch 2014 was announced which will be leaded by Dr. A. Muralidhar Rao as President; Dr. Jithan Venkata Aukunuru as Secretary; Dr. Palnati Narmada, Manager, Natco Research Centre, Hyderabad as Vice President. Symposium was witnessed by APP Telangana State Branch members, UG and PG students of hosting institute and other pharmacy colleges of Andhra Pradesh and Telangana. 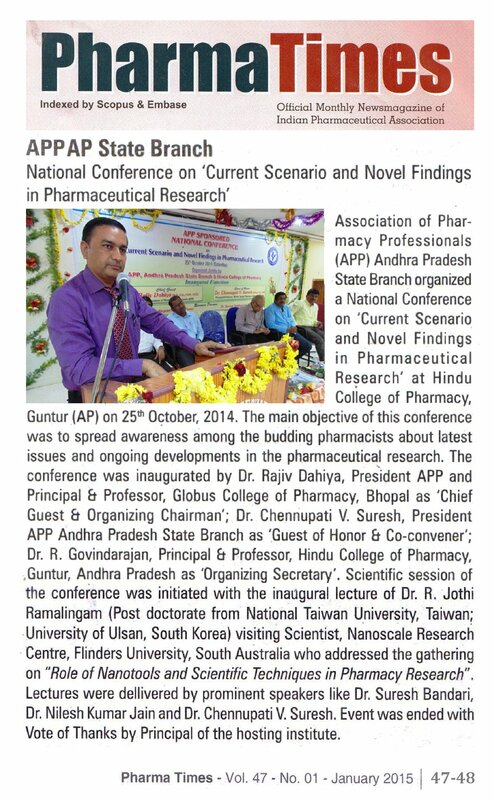 Association of Pharmacy Professionals (APP) Andhra Pradesh State Branch organized a National Conference on ‘Current Scenario and Novel Findings in Pharmaceutical Research’ in collaboration with Hindu College of Pharmacy, Guntur (AP) on 25th October, 2014 at college premise. 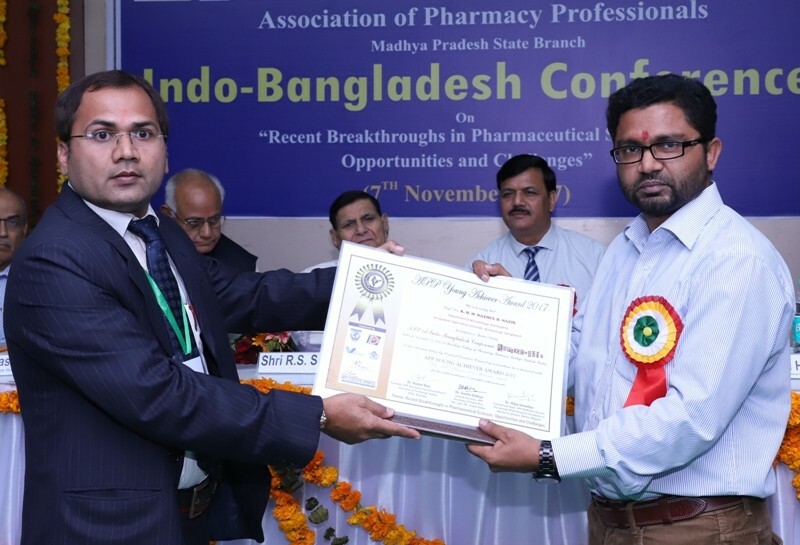 The main objective of this conference was to make aware the budding pharmacists about latest issues and ongoing developments in the pharmaceutical research. 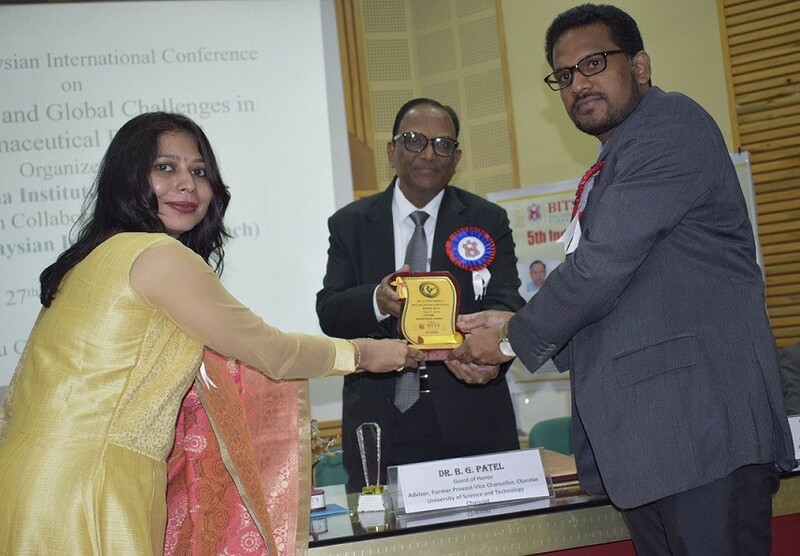 Conference was inaugurated by Dr. Rajiv Dahiya, President APP and Principal & Professor, Globus College of Pharmacy, Bhopal, Madhya Pradesh as ‘Chief Guest & Organizing Chairman’; Dr. Chennupati V. Suresh, President APP Andhra Pradesh State Branch as ‘Guest of Honor & Co-convener’; Dr. R. Govindarajan, Principal & Professor, Hindu College of Pharmacy, Guntur, Andhra Pradesh as ‘Organizing Secretary’. Scientific session of the conference was initiated with the inaugural lecture of Dr. R. Jothi Ramalingam (Post doctorate from National Taiwan University, Taiwan; University of Ulsan, South Korea) Visiting Scientist, Nanoscale Research Centre, Flinders University, South Australia who addressed the gathering on “Role of Nanotools and Scientific Techniques in Pharmacy Research”. 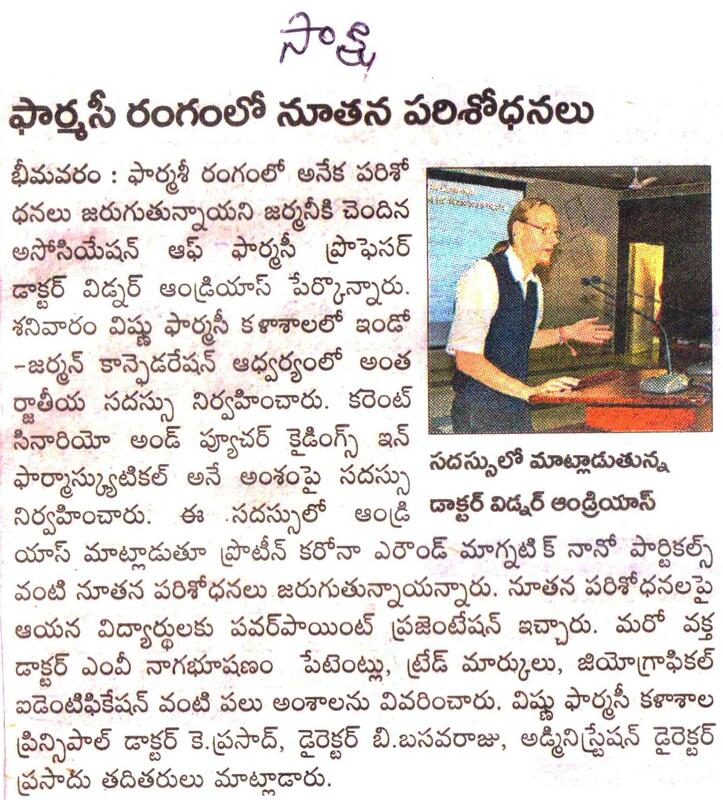 Another lecture was taken by Dr. Suresh Bandari, Principal & Professor, St. Peter’s Institute of Pharmaceutical Sciences, Hanamkonda, Warangal, Telanganaon the topic “Role of Polymers in Development of Novel Drug Delivery Systems”. Lecture of Dr. Bandari was followed by oration of Dr. Nilesh Kumar Jain, Medical Writer, Novartis Healthcare Private Limited, Hyderabad on the topic “Protective Effects of Beta Vulgaris (L.) on Ethanol-mediated Hepatotoxicity and Oxidative Stress: In Vitro and In Vivo Studies”, for which he was confererred with ‘Best Oral Presentation Award’ during the conference. Scientic session was ended with lecture of Dr. Chennupati V. Suresh, Principal & Professor, Mother Teresa Pharmacy College, Sathupally, Khammam and Executive Editor, Journal of Applicable Chemistry on topic “Safe Role of Prescription Medicines”. 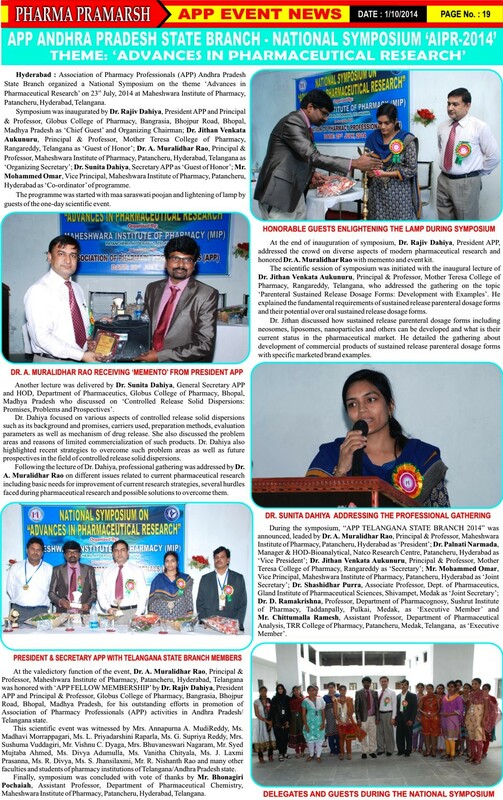 During valedictory function of conference, Dr. G. Saravanan, Associate Professor, Bapatla College of Pharmacy, Bapatla, Guntur; Ms. Abbineni Anusha, Assistant Professor, Department of Pharmaceutics, Vikas Pharmacy College, Visamnapet, Krishna; Ms. Anusha, UG Student, Hindu College of Pharmacy, Guntur; Mr. Y. Bhargav, UG Student, Mother Teresa Pharmacy College, Sathupally received ‘Best Poster Presentation Awards’. 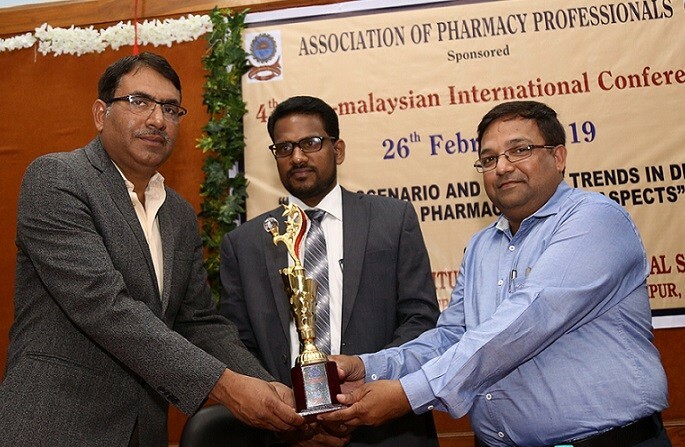 Also ‘Best Student’ Ms. B. Sailaja (B.Pharm) and ‘Best Teacher’ Dr. M. Ramaiah (Assistant Professor, Department of Pharmacogonosy) of the hosting institute were conferred with APP Awards and medals. Conference was witnessed by large crowd of Pharm D, M.Pharm, B.Pharm students and faculties of hosting college and surrounding colleges. Event was ended with vote of thanks by Principal of the hosting institute. 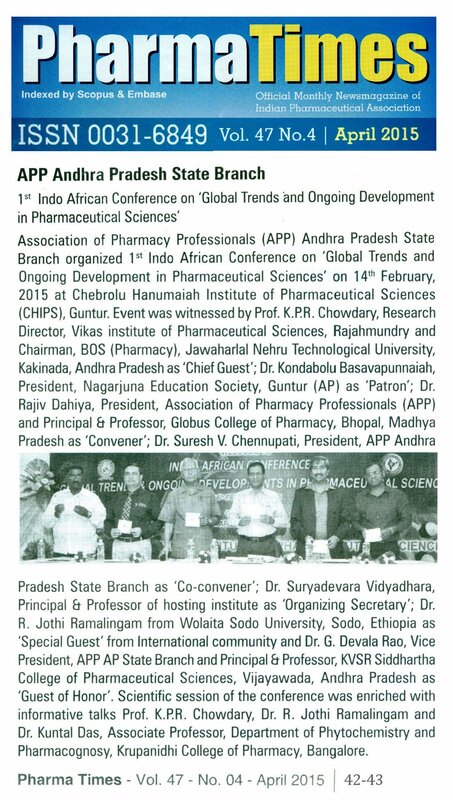 Association of Pharmacy Professionals (APP) Andhra Pradesh State Branch organized 1st Indo African Conference on ‘Global Trends and Ongoing Development in Pharmaceutical Sciences’ on 14th February, 2015 at Chebrolu Hanumaiah Institute of Pharmaceutical Sciences (CHIPS), Chandramoulipuram, Chowdavaram, Guntur. 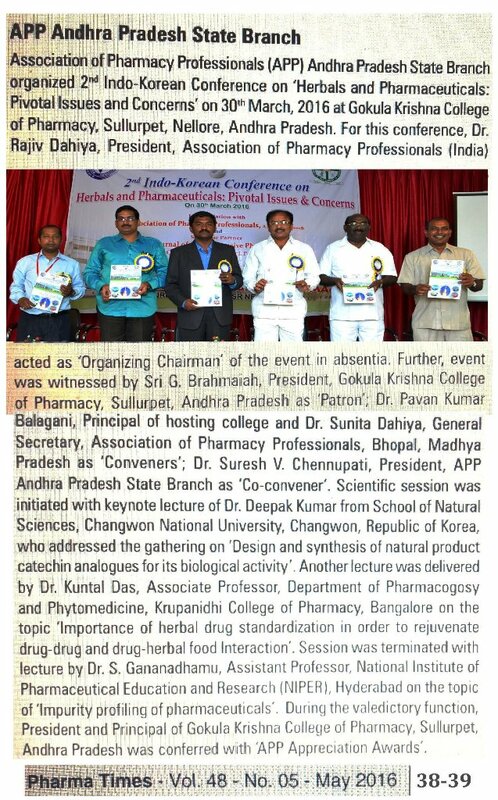 Event was witnessed by Prof. K. P. R. Chowdary, Research Director, Vikas institute of Pharmaceutical Sciences, Rajahmundry and Chairman, BOS (Pharmacy), Jawaharlal Nehru Technological University, Kakinada, Andhra Pradesh as ‘Chief Guest’; Dr. Kondabolu Basavapunnaiah, President, Nagarjuna Education Society, Guntur (AP) as ‘Patron’; Dr. Rajiv Dahiya, President, Association of Pharmacy Professionals (APP) and Principal & Professor, Globus College of Pharmacy, Bhopal, Madhya Pradesh as ‘Convener’; Dr. Suresh V. Chennupati, President, APP Andhra Pradesh State Branch and Principal & Professor, Mother Teresa Pharmacy College, Sathupally, Khammam, Telangana as ‘Co-convener’; Dr. Suryadevara Vidyadhara, Principal & Professor of hosting institute as ‘Organizing Secretary’; Dr. R. Jothi Ramalingam from Wolaita Sodo University, Sodo, Ethiopia as ‘Special Guest’ from International community and Dr. G. Devala Rao, Vice President, APP AP State Branch and Principal & Professor, KVSR Siddhartha College of Pharmaceutical Sciences, Vijayawada, Andhra Pradesh as ‘Guest of Honor’. Inauguration was started with ‘Maa Sarasvati Vandana’ followed by welcome of all the guests on the dias, with bouquet of flowers. Scientific session was initiated with the inaugural lecture of Prof. K. P. R. Chowdary, who addressed the gathering on ‘Research Methodologies and Optimization by Factorial Designs‘. Prof. Chowdary emphasized on the fact that research generates new knowledge as well as forms the backbone for development of individuals as well as organizations. Prof. Chowdary also told that optimization in pharmaceutical formulation involves choosing and combining ingredients that result in a formulation whose attributes confirm to certain preset requirements. 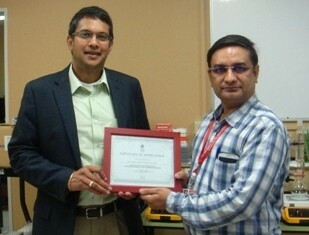 Prof. K. P. R. Chowdary was honored with ‘Academic Excellence Award’ (APP Memorial Award given in memory of “Ch. 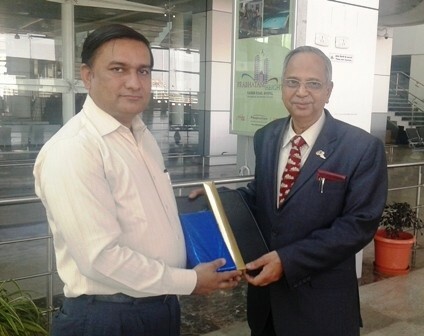 Braham Datt Dahiya”, Grandpa of President APP) by Dr. Rajiv Dahiya, President APP, for his overall tremendous contribution in academic and research throughout the career. Scientific session was continued with lecture of Dr. R. Jothi Ramalingam from Department of Chemistry, School of Natural Science, Wolaita Sodo University, Sodo, Ethiopia on the topic ‘Nanoparticle Cultivation and Characterization for Various Applications’. He discussed about the important role of nanotechnology in medical and engineering sciences. He also explained the use of modern techniques like XRD, TGA, DTA and SEM with EDAX, FTIR as tools of nanotechnology. Dr. Ramalingam demonstrated the basics and interpretation knowledge of these tools for analyzing pharma compounds and discussed about Ayakandha Chenduram (AKC), which is one of the herbo-mineral siddha medicine prepared as per the siddha classical text by the process of calcination and used in the treatment of various disorders especially anaemia. 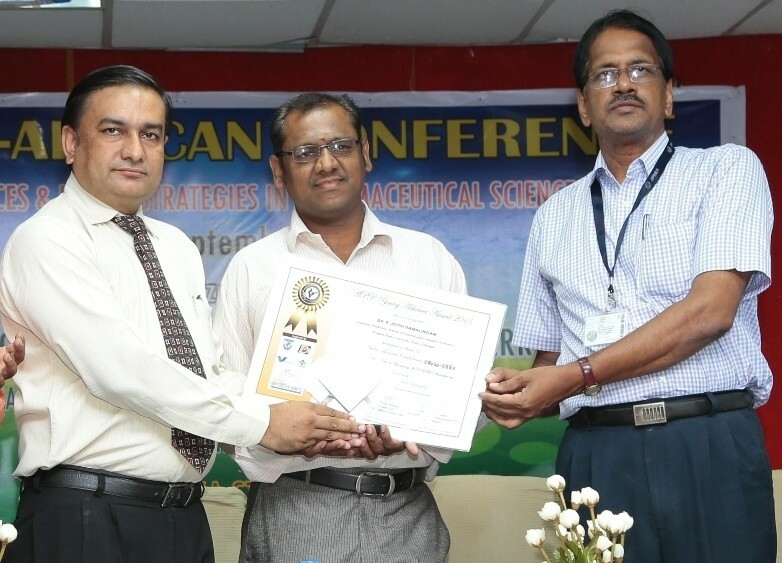 Dr. Ramalingam was conferred with ‘Best Research Paper Award’ in ‘Phytochemistry’ section for paper published in Association’s triannual international journal ‘Bulletin of Pharmaceutical Research’. 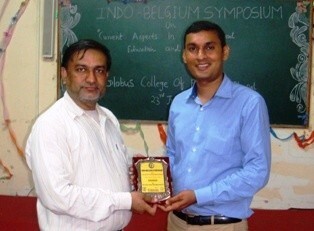 Another invited talk was given by Dr. Kuntal Das, Associate Professor, Department of Phytochemistry and Pharmacognosy, Krupanidhi College of Pharmacy, Bangalore, for which Dr. Das was conferred with ‘Outstanding Oral Presentation Award’ (APP Memorial Award given in memory of ‘Late Mr. Manas Tripathi‘, an active APP member) for his informative talk by President APP. 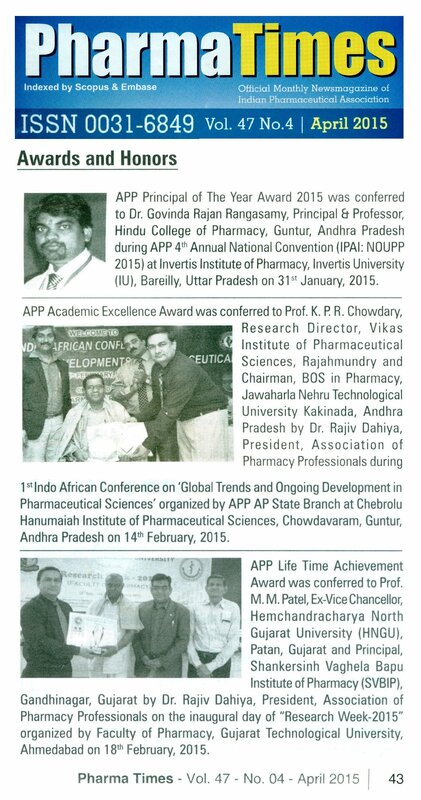 During this Indo African Conference, APP KARNATAKA STATE BRANCH was launched with Dr. Kuntal Das from Krupanidhi College of Pharmacy, Bangalore as ‘President’; Dr. Rinku Mathappan from Gautham College of Pharmacy, Bangalore as ‘Secretary’; Dr. Nishi Nayak from Krupanidhi College of Pharmacy, Bangalore as ‘Vice President’ of APP KA State Branch 2015. Also Dr. Suryadevara Vidyadhara, Principal & Professor, CHIPS, Guntur was nominated as ‘Joint Secretary’ of APP AP State Branch 2015. 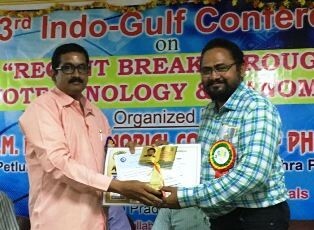 Moreover, Mr. Amaresh Prusty, Assistant Professor, College of Pharmaceutical Science, Baliguali, Puri, Odisha was honored with ‘Best Research Paper Award’ in ‘Pharmaceutical Technology’ section for his paper published in ‘Bulletin of Pharmaceutical Research’. 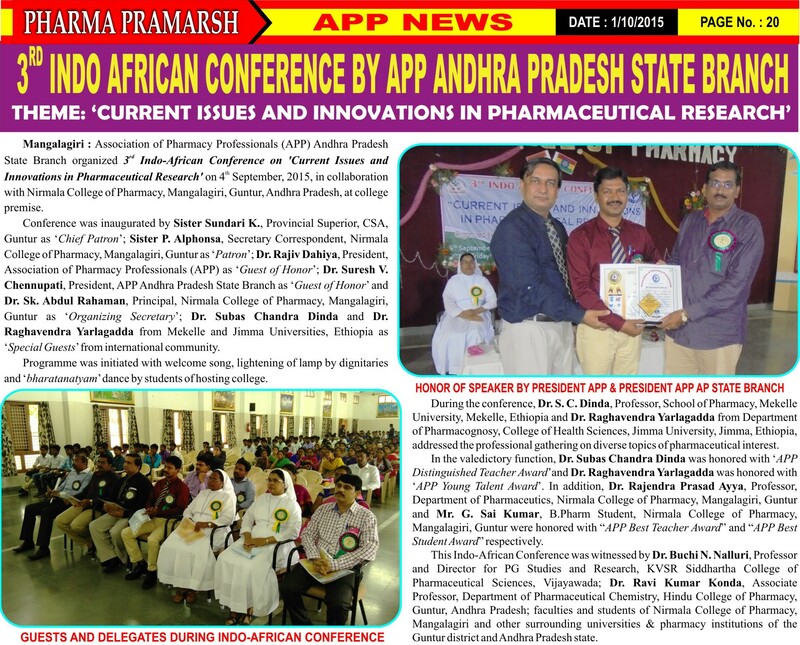 During the valedictory function of Indo African Conference, the ‘Chief Guest’ Prof. T. V. Narayana, Chairman, IPA Education Division, together with President APP, launched APP COMMUNITY & CLINICAL PHARMACY DIVISION, with Sh. 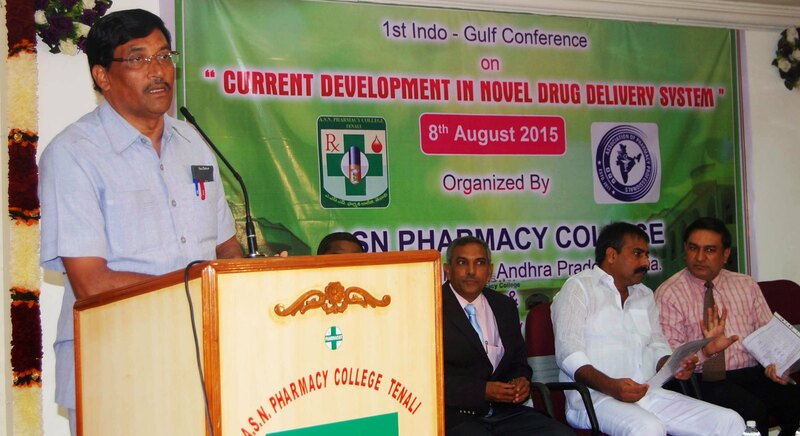 P. Seetharamiah, Vice Principal, Hindu College of Pharmacy, Guntur, Andhra Pradesh as ‘Divisional Head’; Dr. Mohd. 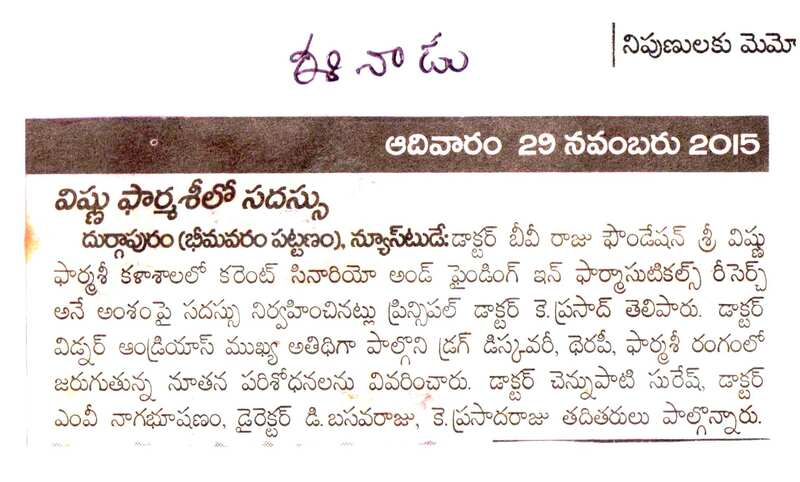 Altaf from Deccan School of Pharmacy, Hyderabad, Telangana as ‘Co-ordinator’; Dr. Hari Babu from Chebrolu Hanumaiah Institute of Pharmaceutical Sciences, Chowdavaram, Guntur as ‘Co-ordinator’ and Mr. Ram Anne from Hindu College of Pharmacy, Guntur as ‘Student Co-ordinator’ of APP CCP Division 2015. 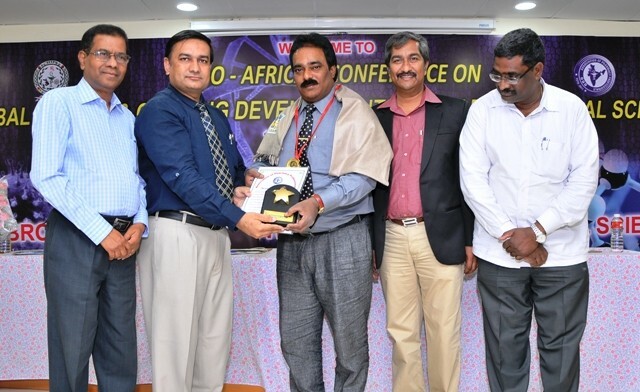 Prof. T. V. Narayana was honored with ‘APP Appreciation Award’ for his esteemed presence during the APP AP State Branch – Indo African Conference. At the end, Dr. R. L. C. Sasidhar and Ms. D. Lakshmi Harika from Chebrolu Hanumaiah Institute of Pharmaceutical Sciences, Guntur were honored with ‘APP Best Teacher’ and ‘APP Best Student’ awards. Programme was concluded with distribution of prizes and medals to poster awardees and honoring of Principals of surrounding pharmacy colleges with ‘Appreciation Certificates’ by President APP and Principal of the hosting institute. 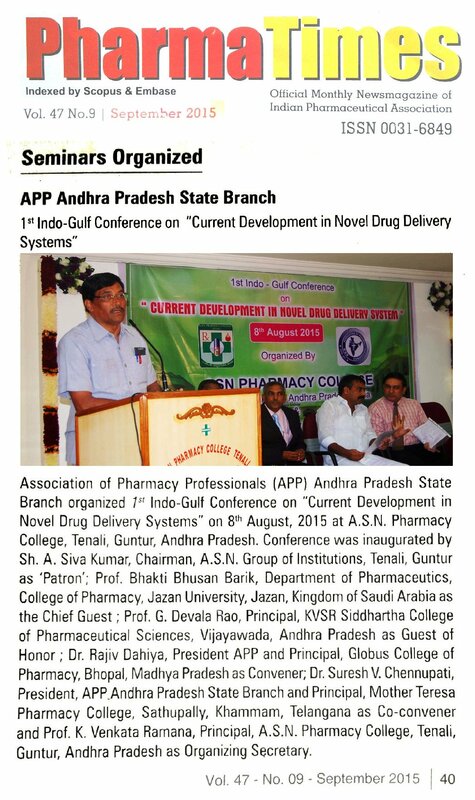 Association of Pharmacy Professionals (APP) Andhra Pradesh State Branch organized 1st Indo-Gulf Conference on “Current Development in Novel Drug Delivery Systems” on 8th August, 2015 in collaboration with A.S.N. 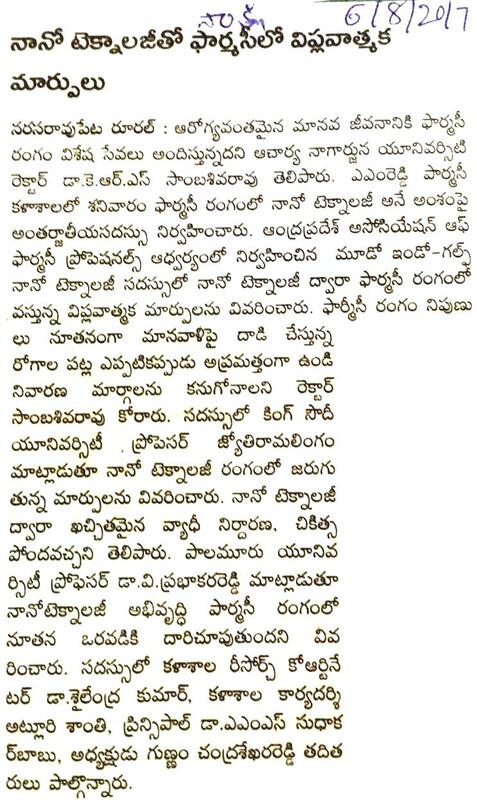 Pharmacy College, Tenali, Guntur, Andhra Pradesh at college campus. Conference was inaugurated by Sh. 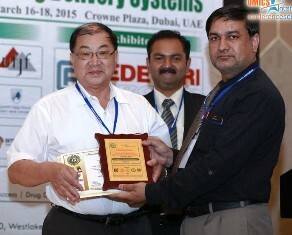 A. Siva Kumar, Chairman, A.S.N. 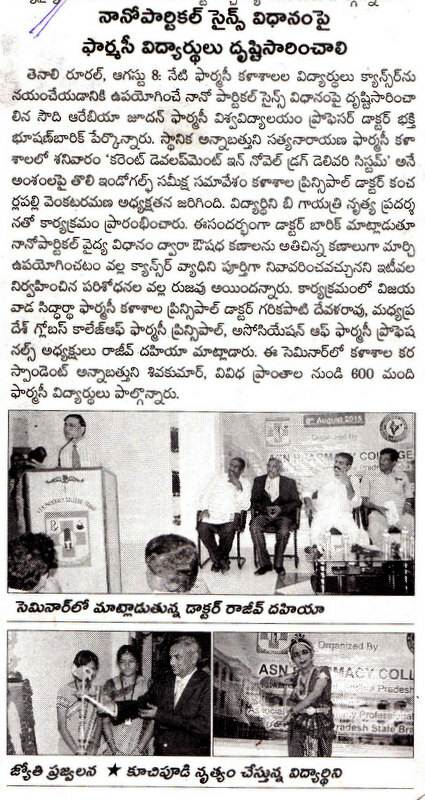 Group of Institutions, Tenali, Guntur as ‘Chief Patron’; Prof. Bhakti Bhusan Barik, Department of Pharmaceutics, College of Pharmacy, Jazan University, Jazan, Kingdom of Saudi Arabia as the ‘Chief Guest’; Prof. G. Devala Rao, Principal, KVSR Siddhartha College of Pharmaceutical Sciences, Vijayawada, Andhra Pradesh as ‘Guest of Honor’; Dr. Rajiv Dahiya, President APP and Principal, Globus College of Pharmacy, Bhopal, Madhya Pradesh as ‘Convener’; Dr. Suresh V. Chennupati, President, APP Andhra Pradesh State Branch and Principal, Mother Teresa Pharmacy College, Sathupally, Khammam, Telangana as ‘Co-convener’ and Prof. K. Venkata Ramana, Principal, A.S.N. Pharmacy College, Tenali, Guntur, Andhra Pradesh as ‘Organizing Secretary’.Programme started with “Bharatanatyam Dance” by student of hosting college and inauguration of conference CD. 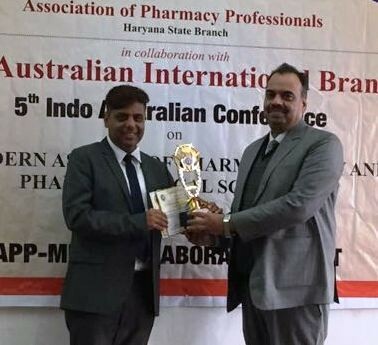 Felicitation of Dr. Rajiv Dahiya, President of Association of Pharmacy Professionals (APP) was done by the Chairman and Principal of A.S.N. 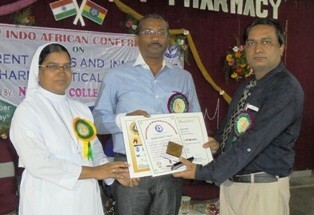 Pharmacy College, Tenali with memento. 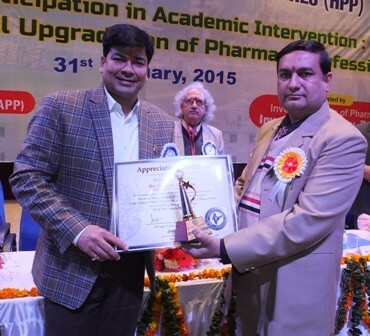 Dr. Dahiya made the gathering aware of aims and objectives of Association of Pharmacy Professionals. Scientific session of the conference started with inaugural lecture of Dr. Rajiv Dahiya on ‘Controlled Drug Delivery of Complex Cyclopolypeptides’. He told that the controlled release mechanisms and effective parameters need to be understood in order to design and develop long-acting, more effective peptide and protein drugs. 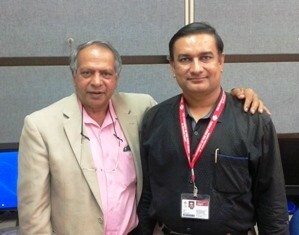 Lecture of Dr. Dahiya was followed by talk of Prof. B. B. Barik on ‘Novel Drug Delivery System: Nanotechnology’. Dr. Barik told that clinically useful drug delivery systems need to deliver a certain amount of a drug that can be therapeutically effective, and often over an extended period of time. Such requirements can be met by the micro and nano scale drug delivery systems manufactured by nanotechnology. Prof. B. 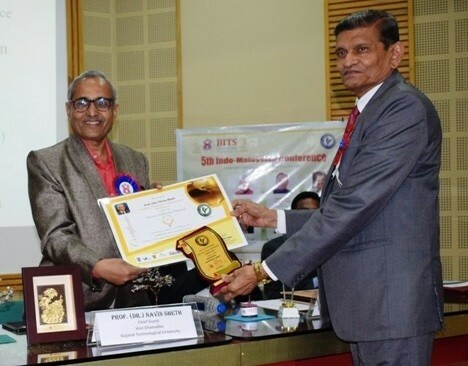 B. Barik was felicitated with ‘APP Eminent Pharmacy Teacher Award 2015’ by President APP – Dr. Rajiv Dahiya and President APP AP State Branch – Dr. Suresh V. Chennupati, for his vital contribution in pharmaceutical education in India and Abroad. 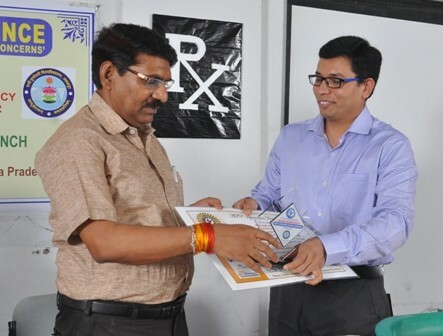 Dr. Barik has served College of Pharmaceutical Science, Mohuda, Berhampur, Orissa; University Department of Pharmaceutical Sciences, Utkal University, Bhubaneswar in past and presently working as Professor at Department of Pharmaceutics, College of Pharmacy, Jazan University, Jazan, Kingdom of Saudi Arabia. 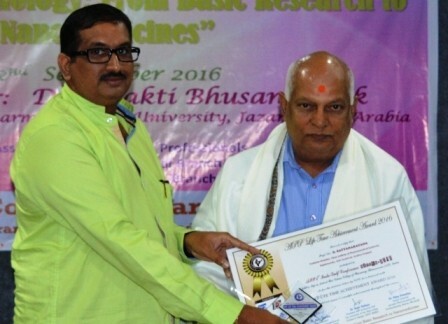 Prof. Barik is recipient of ‘Bharat Shiksha Ratan Award’, ‘International Gold Star Award’, ‘Indo-Thai Sadbhavana Award’ in past. 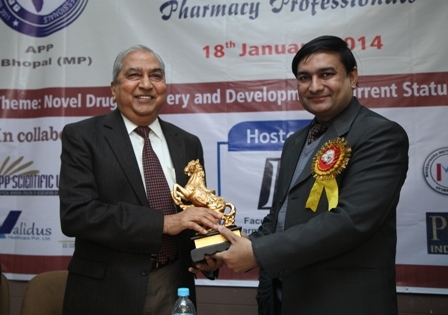 Moreover, Prof. Barik was nominated as ‘International Head’ of APP Community Pharmacy Division. 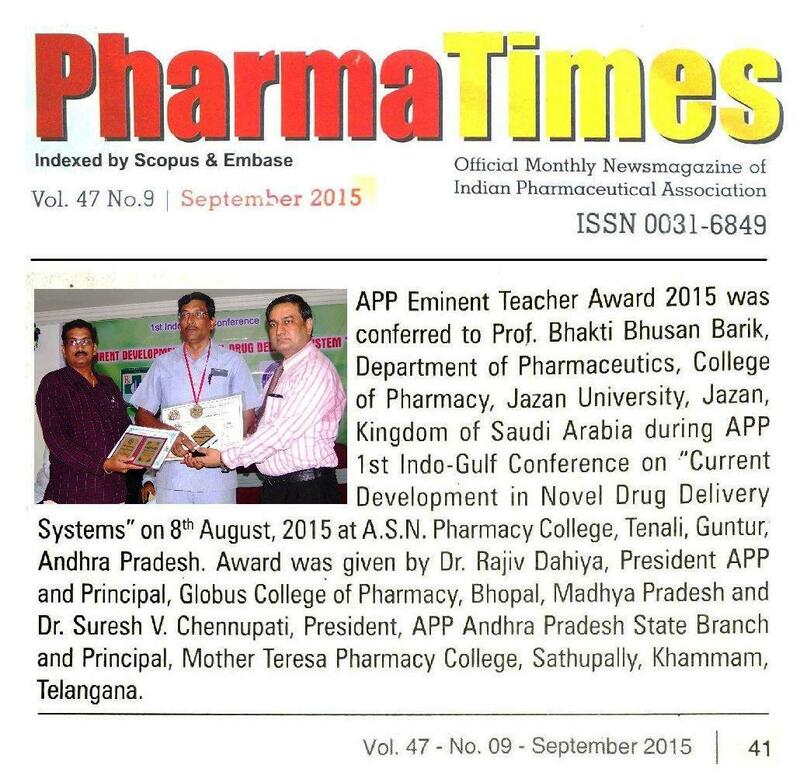 Also Dr. Suresh V. Chennupati, Principal, Mother Teresa Pharmacy College, Sathupally, Khammam, Telangana was honored with ‘APP Principal of The Year Award 2015’ by President of Association of Pharmacy Professionals (APP) and Principal, KVSR Siddhartha College of Pharmaceutical Sciences, Vijayawada, Andhra Pradesh. Also ‘APP Appreciation Award’ was given to Prof. A. Muralidhar Rao by President APP and President APP AP State Branch for his professional contribution in Telangana State. 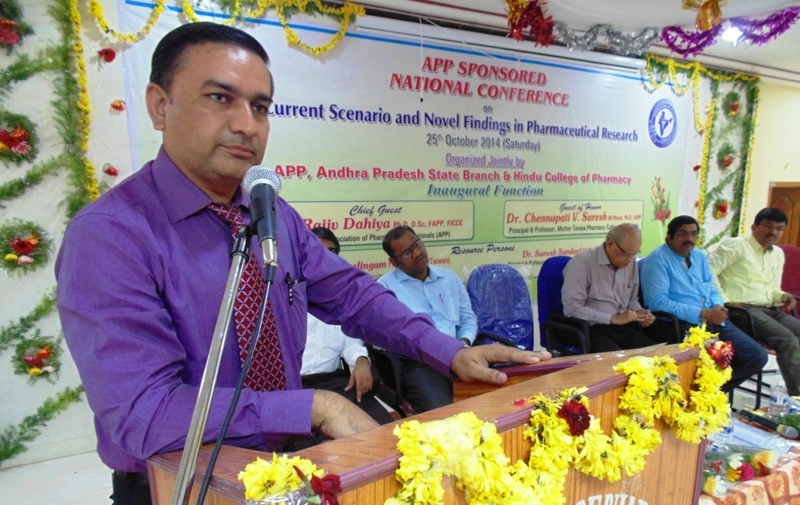 Scientific session of the conference was continued with lecture of Prof. A. Muralidhar Rao, President, APP Telangana State Branch and Principal, Maheshwara Institute of Pharmacy, Patancheru, Hyderabad (TS) on the topic ‘Application of “Nanoscience” in Pharmaceutics’. Dr. Rao discussed that nanotechnology R&D is directed toward understanding and creating improved materials, devices, and systems that exploit these new properties. He told that nanotechnology is the understanding and control of matter at dimensions of roughly 1 to 100 nanometers, where unique phenomena enable novel applications. 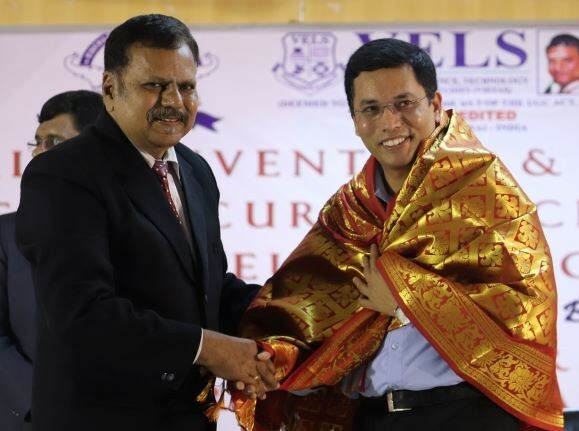 After his informative talk, Prof. Rao was honored with memento and shawl by Prof. K. Venkata Ramana, Principal, A.S.N. 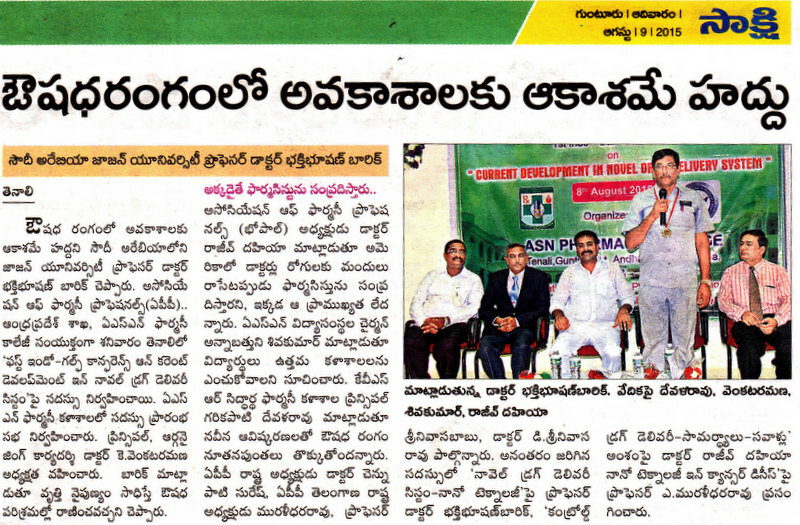 Pharmacy College, Tenali, Guntur, Andhra Pradesh and Prof. Abdul Rahaman, Principal, Nirmala College of Pharmacy, Mangalagiri, Guntur, Andhra Pradesh. During valedictory function of the conference, Dr. CH Narasimha Raju BH, Professor, Department of Pharmaceutical Analysis, A.S.N. 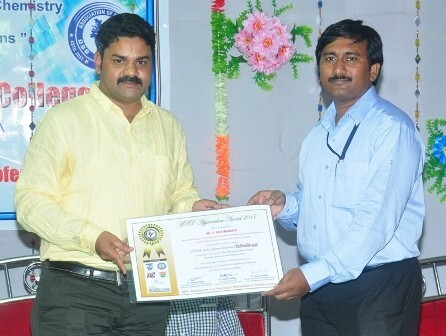 Pharmacy College, Tenali was honored with “APP Best Teacher Award”. 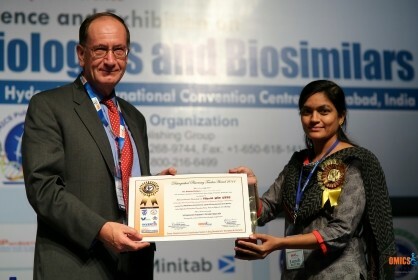 Also Ms. E. Pragna, B.Pharm 4th year student of hosting institute was honored with “APP Best Student Award”. 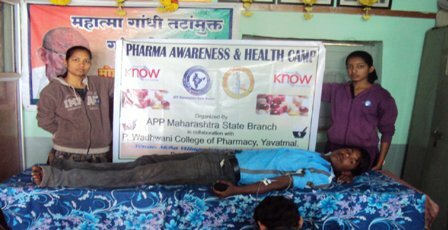 During the event, posters were presented by students on different topics of pharmaceutical interest. 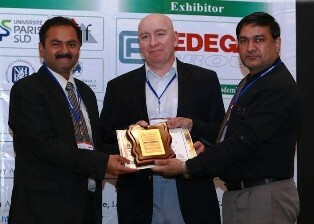 Also the Chairman and Principal of hosting institute were honored with ‘APP Appreciation Awards’. 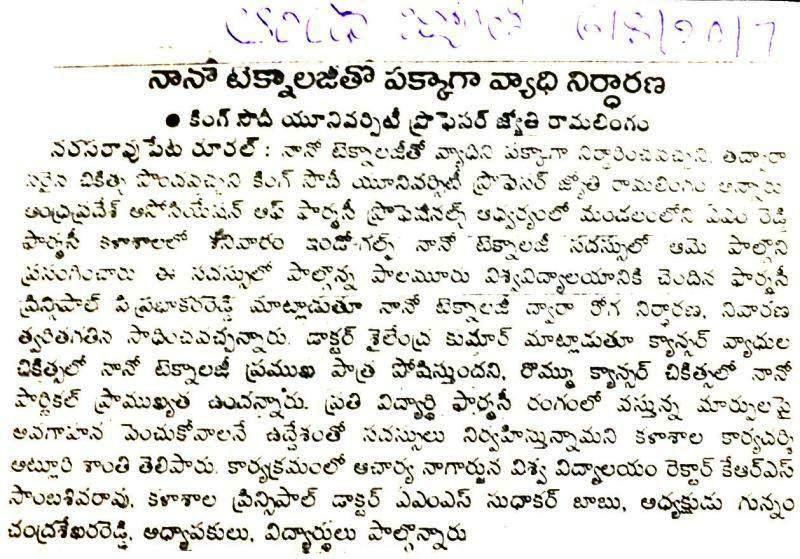 This APP 1st Indo-Gulf conference was witnessed by Prof. P. Srinivasa Prasanna, Principal, Malineni Lakshmaiah College of Pharmacy, Kanumalla, Singarayakonda; Prof. P. Srinivasa Babu, Principal, Vignan Pharmacy College, Vadlamudi, Guntur; Prof. A. Prameela Rani, Principal, University College of Pharmaceutical Sciences, Acharya Nagarjuna University, Guntur as well as undergraduate, postgraduate and Pharm.D students of surrounding pharmacy colleges viz. 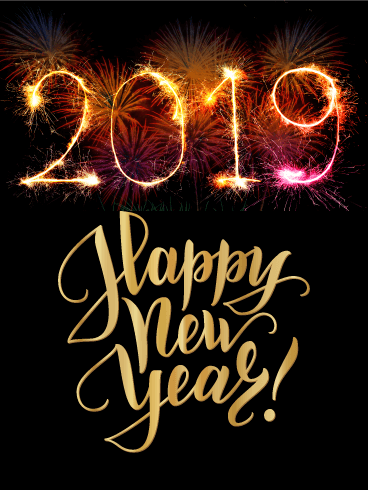 Hindu College of Pharmacy, Guntur; Nirmala College of Pharmacy, Mangalagiri; KVSR Siddhartha College of Pharmaceutical Sciences, Vijayawada and Chebrolu Hanumaiah Institute of Pharmaceutical Sciences (CHIPS), Chowdavaram, Chandramoulipuram, Guntur, Andhra Pradesh. Programme was ended with vote of thanks by Prof. K. Venkata Ramana. 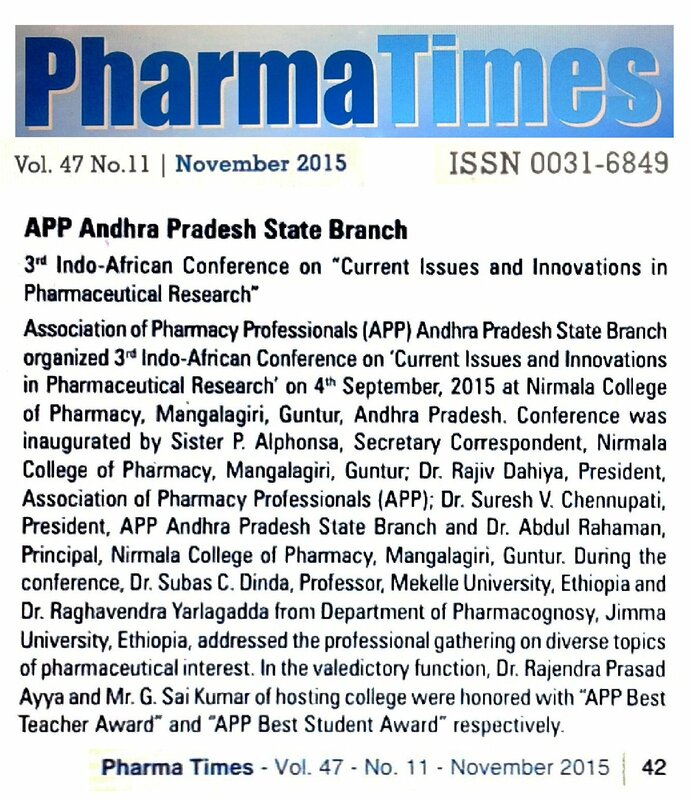 Association of Pharmacy Professionals (APP) Andhra Pradesh State Branch organized 3rd Indo-African Conference on ‘Current Issues and Innovations in Pharmaceutical Research’ on 4th September, 2015, in collaboration with Nirmala College of Pharmacy, Mangalagiri, Guntur, Andhra Pradesh, at college premise. 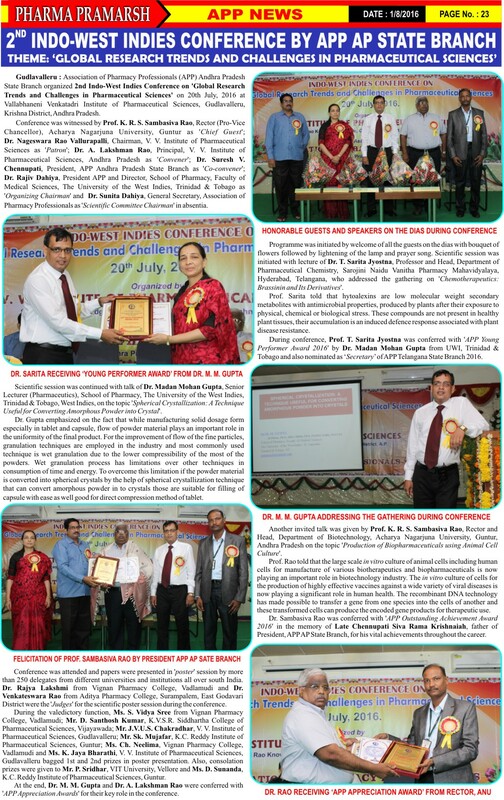 Conference was inaugurated by Sister Sundari K., Provincial Superior, CSA, Guntur as ‘Chief Patron’; Sister P. Alphonsa, Secretary Correspondent, Nirmala College of Pharmacy, Mangalagiri, Guntur as ‘Patron’; Dr. Rajiv Dahiya, President, Association of Pharmacy Professionals (APP) as ‘Guest of Honor’; Dr. Suresh V. Chennupati, President, APP Andhra Pradesh State Branch as ‘Guest of Honor’ and Dr. Sk. Abdul Rahaman, Principal, Nirmala College of Pharmacy, Mangalagiri, Guntur as ‘Organizing Secretary’; Dr. Subas Chandra Dinda and Dr. Raghavendra Yarlagadda from Mekelle and Jimma Universities, Ethiopia as ‘Special Guests’ from international community. Programme was initiated with welcome song, lightening of lamp by dignitaries and ‘bharatanatyam’ dance by students of hosting college. During the conference, Dr. S. C. Dinda, Professor, School of Pharmacy, Mekelle University, Mekelle, Ethiopia and Dr. Raghavendra Yarlagadda from Department of Pharmacognosy, College of Health Sciences, Jimma University, Jimma, Ethiopia, addressed the professional gathering on diverse topics of pharmaceutical interest. 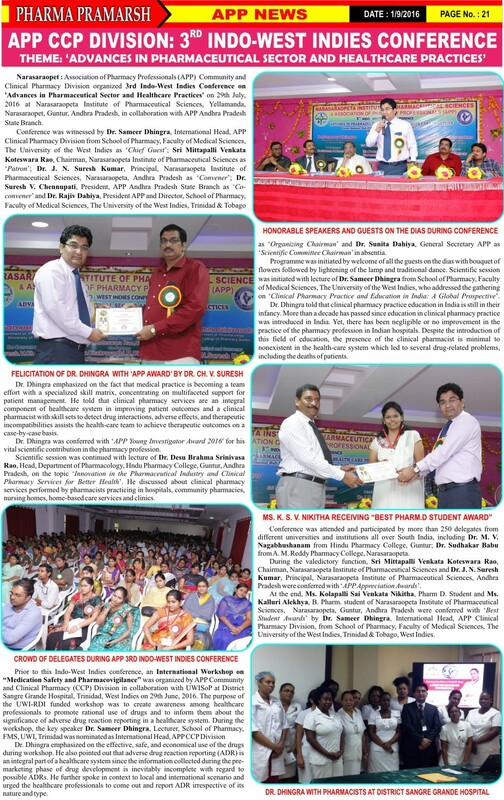 In the valedictory function, Dr. Subas Chandra Dinda was honored with ‘APP Distinguished Teacher Award’ and Dr. Raghavendra Yarlagadda was honored with ‘APP Young Talent Award’. 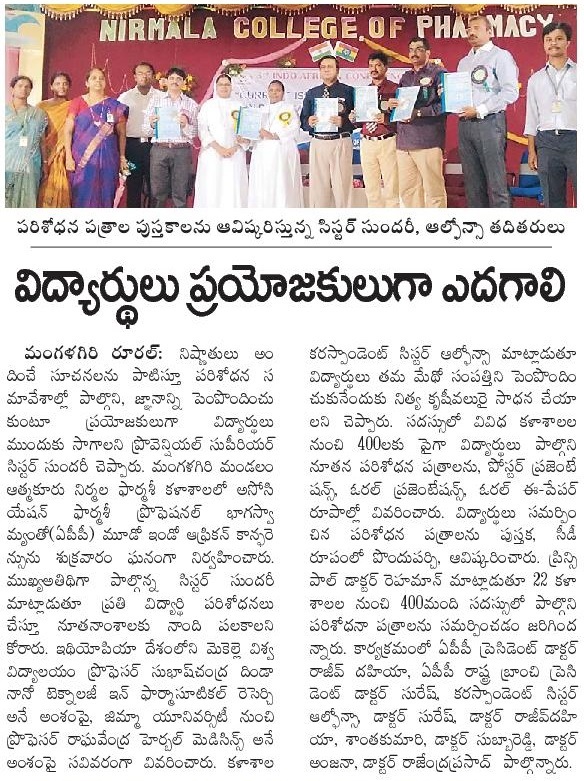 In addition, Dr. Rajendra Prasad Ayya, Professor, Department of Pharmaceutics, Nirmala College of Pharmacy, Mangalagiri, Guntur and Mr. G. Sai Kumar, B.Pharm Student, Nirmala College of Pharmacy, Mangalagiri were honored with “APP Best Teacher Award” and “APP Best Student Award”. 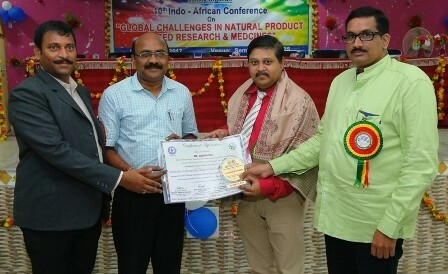 This Indo-African Conference was witnessed by Dr. Buchi N. Nalluri, Professor and Director for PG Studies and Research, KVSR Siddhartha College of Pharmaceutical Sciences, Vijayawada; Dr. Ravi Kumar Konda, Associate Professor, Department of Pharmaceutical Chemistry, Hindu College of Pharmacy, Guntur, Andhra Pradesh; faculties and students of Nirmala College of Pharmacy, Mangalagiri and other surrounding universities & pharmacy institutions of the Guntur district and Andhra Pradesh. 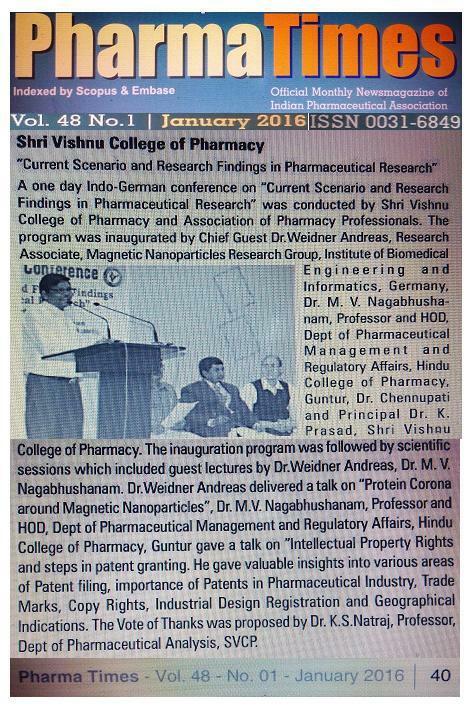 Association of Pharmacy Professionals (APP) Andhra Pradesh State Branch organized 1st Indo-German Conference on ‘Current Scenario and Future Findings in Pharmaceutical Research’ on 18th November, 2015 at Shri Vishnu College of Pharmacy, Bhimavaram, West Godavari, Andhra Pradesh. 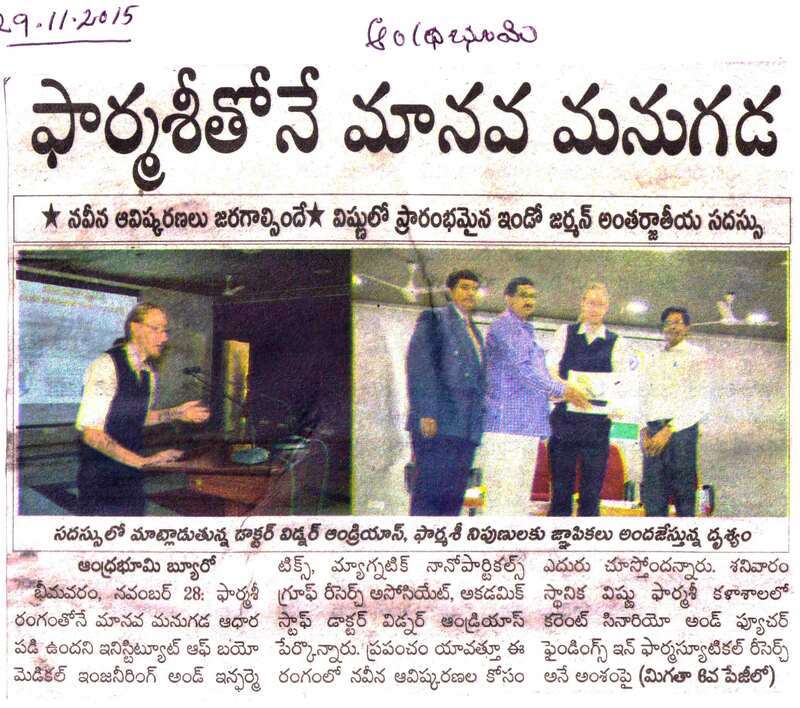 Event was witnessed by Dr. Weidner Andreas from Technische Universität Ilmenau, Ilmenau, Germany as ‘Chief Guest‘; Sh. K. V. Vishnu Raju, Chairman, Shri Vishnu Educational Society, Bhimavaram, Andhra Pradesh as ‘Chief Patron‘; Dr. Suresh V. Chennupati, President, APP Andhra Pradesh State Branch, Guntur, Andhra Pradesh as ‘Convener‘; Dr. D. B. Raju, Director & Professor, Shri Vishnu College of Pharmacy, Bhimavaram, West Godavari, Andhra Pradesh as ‘Co-convener’; Dr. K. Prasad, Principal & Professor, Shri Vishnu College of Pharmacy, Bhimavaram, West Godavari, Andhra Pradesh as ‘Organizing Secretary‘. 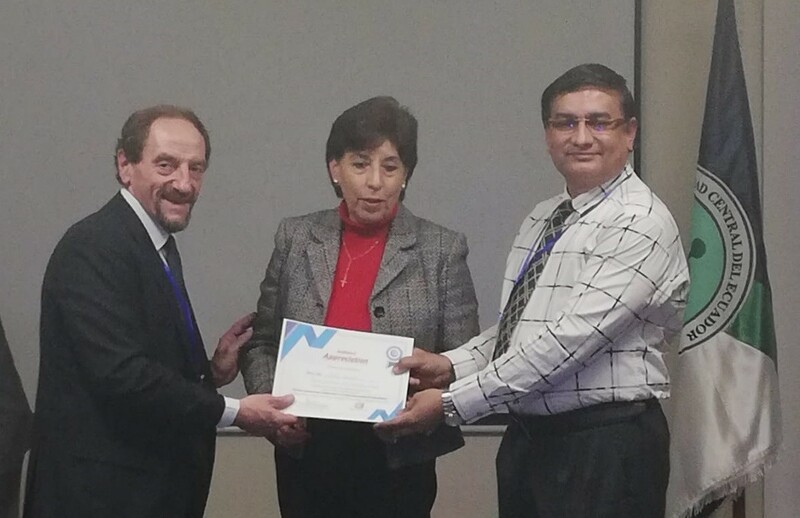 Further, Dr. Rajiv Dahiya, President APP and Professor, Department of Pharmacy, College of Health Sciences, Mizan-Tepi University, Mizan, Ethiopia acted as ‘Organizing Chairman‘ and Dr. Sunita Dahiya, General Secretary APP and Professor, Department of Pharmacy, College of Health Sciences, Mizan-Tepi University, Mizan, Ethiopia acted as ‘Chairman- Scientific Committee‘ of the conference in absentia. Inauguration was started with ‘Prayer‘ followed by welcome of all the guests on the dias with bouquet of flowers. Scientific session was initiated with keynote lecture of Dr. Weidner Andreas from Magnetic Nanoparticles Group, Institute of Biomedical Engineering and Informatics (BMTI), Technische Universität Ilmenau, Ilmenau, Germany, who addressed the gathering on ‘Protein Corona around Magnetic Nanoparticles‘. Dr. Andreas told that when exposing nanomaterials like superparamagnetic iron oxide nanoparticles (SPIONs) to the peripheral blood, a protein corona consisting of various components is formed immediately. The composition of the corona as well as their amount bound to the particle surface is dependent on different factors such as particle size and surface charge. 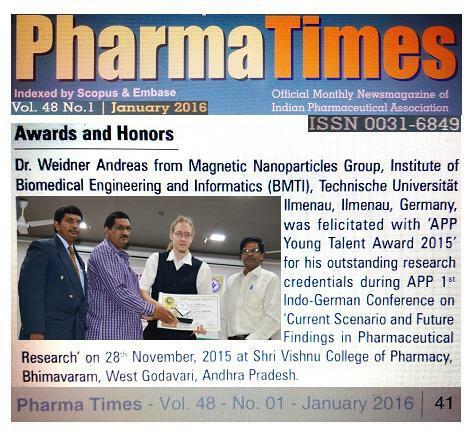 Dr. Weidner Andreas was honored with ‘APP Young Talent Award 2015’ for his outstanding scientific performance by President APP Andhra Pradesh State Branch, Guntur. 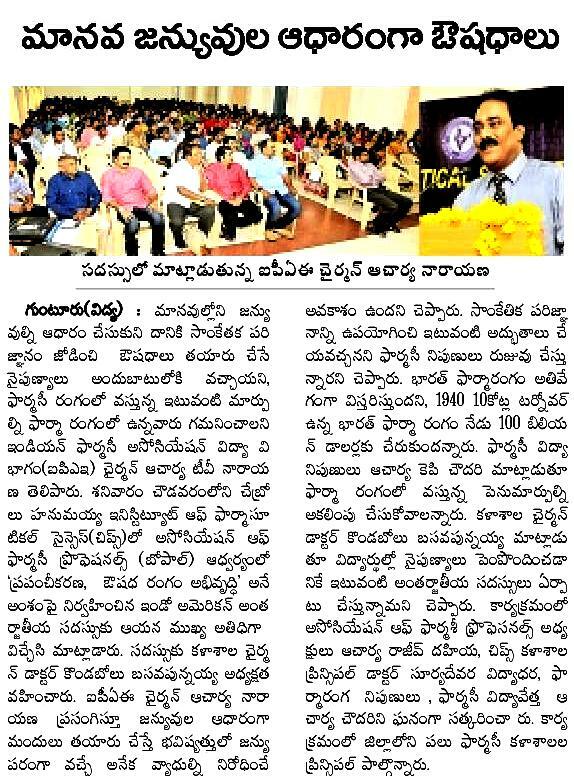 Scientific session was continued with lecture of Dr. M. V. Nagabhushanam, Professor and HOD, Department of Pharmaceutical Management and Regulatory Affairs, Hindu College of Pharmacy, Guntur, Andhra Pradesh on the topic ‘Intellectual Property Rights and Steps in Patent Granting‘. Dr. Nagabhushanam told that intellectual property rights (IPR) are the rights given to people over the creation of their minds. They usually give the creator an exclusive right over the use of his/her creations for a certain period of time. 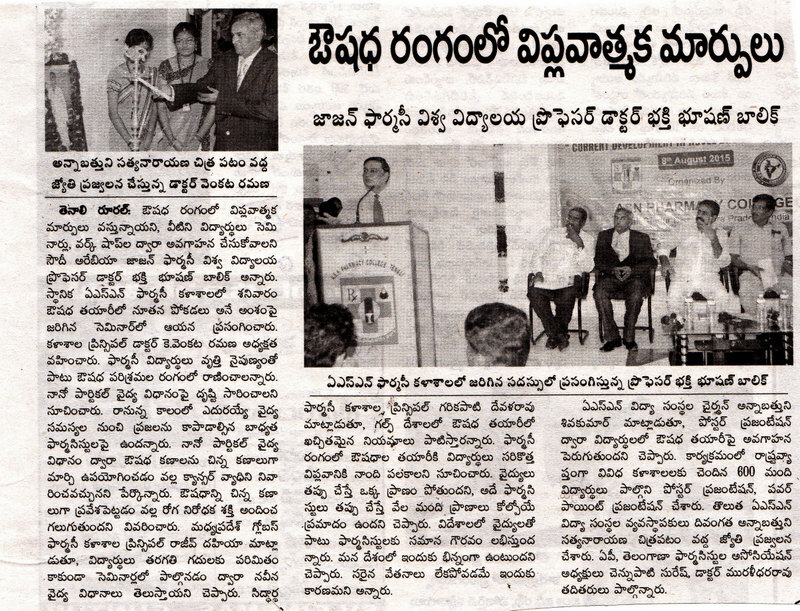 Dr. M. V. Nagabhushanam was honored with memento by Dr. M. Raghu Prasad, faculty of hosting institution. Conference was attended and papers were presented in ‘poster’ session by more than 200 delegates all over the state. 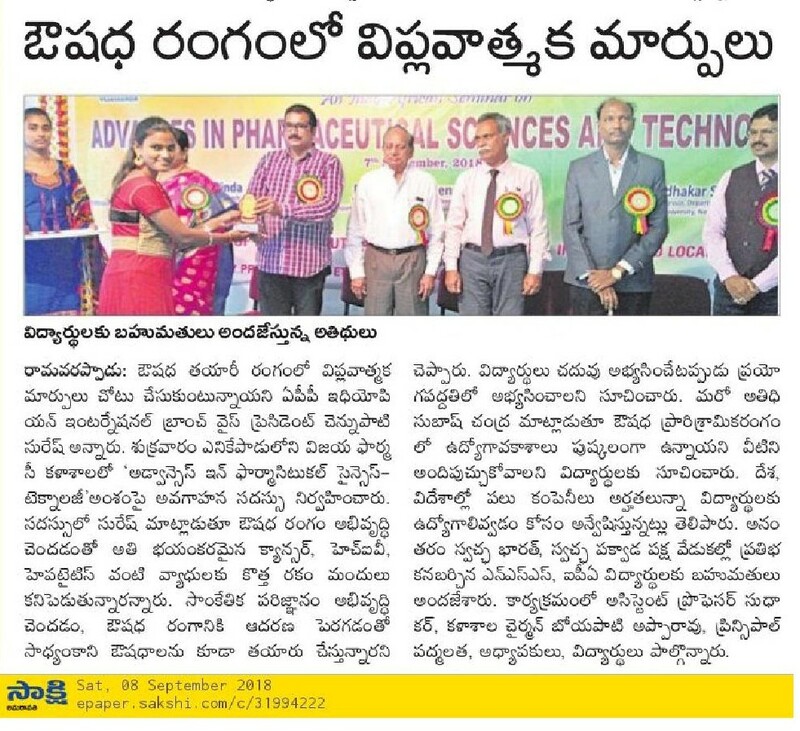 Event was witnessed by all the faculty members of Shri Vishu College of Pharmacy, Bhimavaram including Dr. M. Mohan Varma, Dr. A. Srinivasa Rao, Dr. A. R. Phani, Dr. N. Silvia and Dr. S.T.K. Sridhar. At the end, Dr. Suresh V. Chennupati, President, APP Andhra Pradesh State Branch was honored with memento by Dr. P. V. Swamy, Senior Professor of Department of Pharmaceutical Technology of the hosting institution and Dr. Weidner Andreas was felicitated with memento by Dr. K. Prasad, Principal and Professor, Shri Vishnu College of Pharmacy, Bhimavaram, West Godavari, Andhra Pradesh. During the valedictory function, Dr. D. B. Raju, Director & Professor, Shri Vishnu College of Pharmacy, Bhimavaram and Sri K. V. Vishnu Raju, Chairman, Shri Vishu College of Pharmacy, Bhimavaram were conferred with ‘APP Appreciation Awards‘ by the President, APP Andhra Pradesh State Branch. Ms. N. Hanisha, B. Pharm final year student of hosting college won ‘First prize’ in poster competition on the topic ‘Misuse of Prescription Drugs’. Second and third prizes were given to Mr. G. Raj Kumar on topic ‘Anti-HIV using Nanorobots’ and Ms. K. Sireesha on topic ‘Insulin Chewing Gums’. Programme ended with vote of thanks by Dr. K. S. Nataraj, programme coordinator from hosting college. 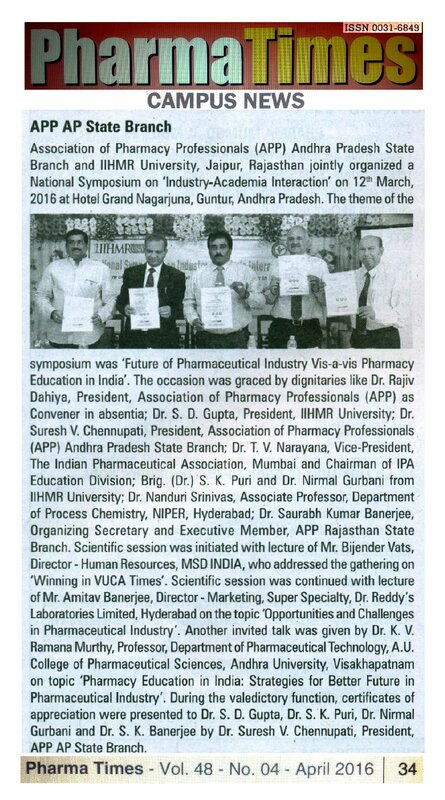 Association of Pharmacy Professionals (APP) Andhra Pradesh State Branch and IIHMR University, Jaipur, Rajasthan jointly organized National Symposium on ‘Industry-Academia Interaction’ on 12th March, 2016 at Hotel Grand Nagarjuna, Guntur, Andhra Pradesh. 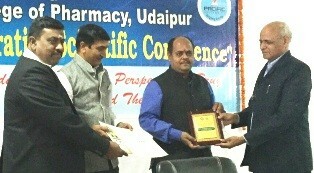 The theme of the symposium was ‘Future of Pharmaceutical Industry vis a vis Pharmacy Education in India’. 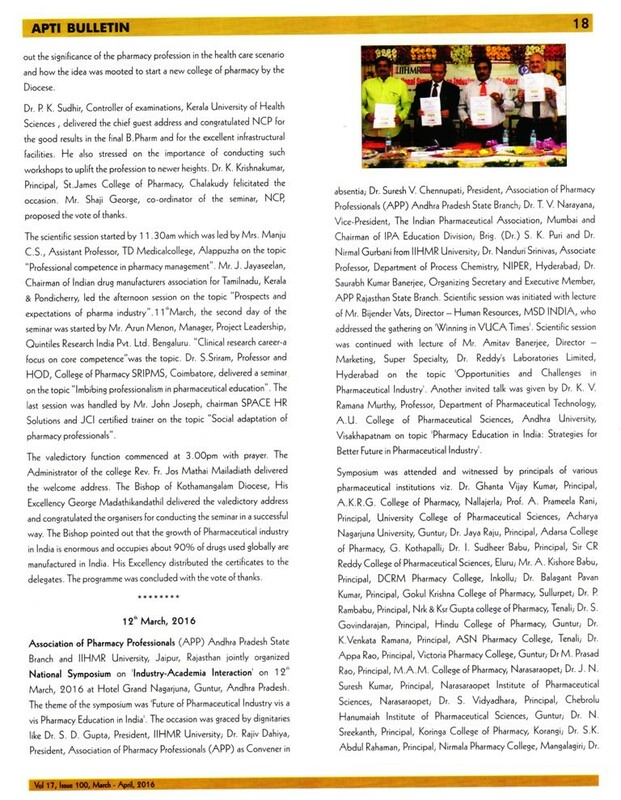 The occasion was graced by dignitaries like Dr. S. D. Gupta, President, IIHMR University; Dr. Rajiv Dahiya, President, Association of Pharmacy Professionals (APP) as Convener in absentia; Dr. Suresh V. Chennupati, President, Association of Pharmacy Professionals (APP) Andhra Pradesh State Branch; Dr. T. V. Narayana, Vice-President, The Indian Pharmaceutical Association, Mumbai and Chairman of IPA Education Division; Brig. 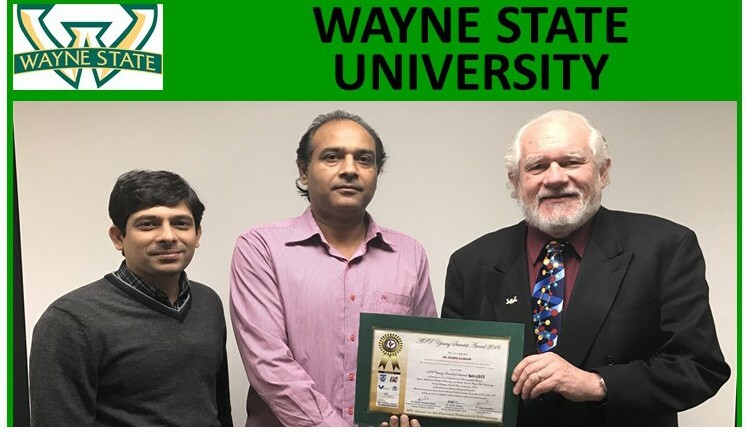 (Dr.) S. K. Puri and Dr. Nirmal Gurbani from IIHMR University; Dr. Nanduri Srinivas, Associate Professor, Department of Process Chemistry, NIPER, Hyderabad; Dr. Saurabh Kumar Banerjee, Organizing Secretary and Executive Member, APP Rajasthan State Branch. 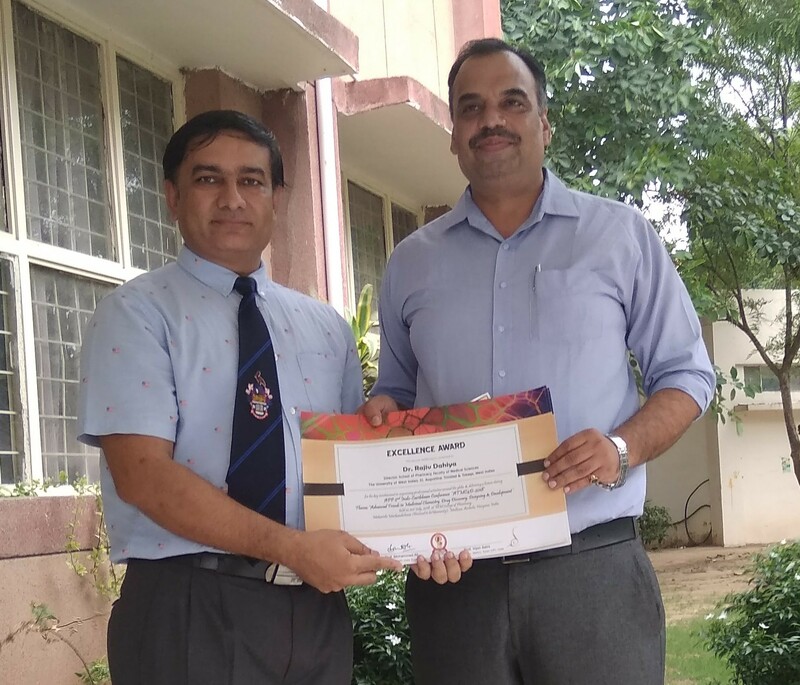 Scientific session was initiated with lecture of Mr. Bijender Vats, Director – Human Resources, MSD INDIA, who addressed the gathering on ‘Winning in VUCA Times’. Scientific session was continued with lecture of Mr. Amitav Banerjee, Director – Marketing, Super Specialty, Dr. Reddy’s Laboratories Limited, Hyderabad on the topic ‘Opportunities and Challenges in Pharmaceutical Industry’. 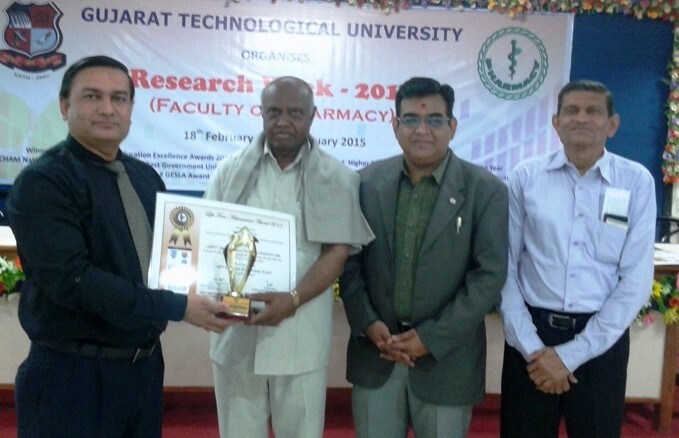 Another invited talk was given by Dr. K. V. Ramana Murthy, Professor, Department of Pharmaceutical Technology, A.U. College of Pharmaceutical Sciences, Andhra University, Visakhapatnam on topic ‘Pharmacy Education in India: Strategies for Better Future in Pharmaceutical Industry’. 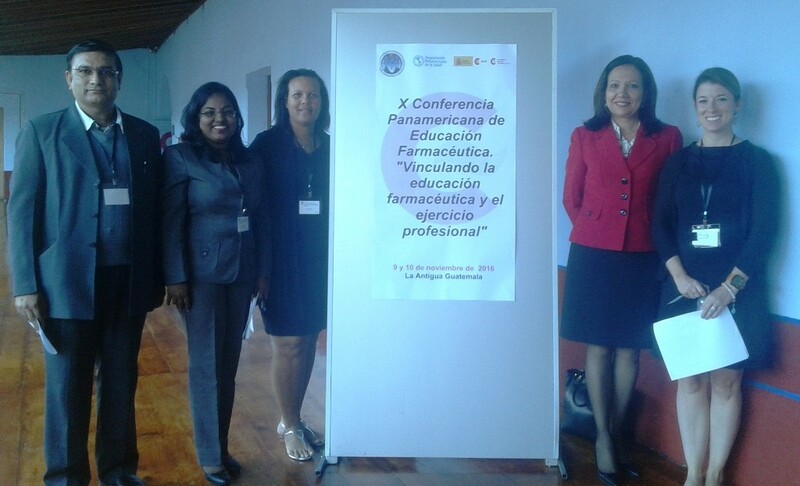 Symposium was attended and witnessed by principals of various pharmaceutical institutions viz. 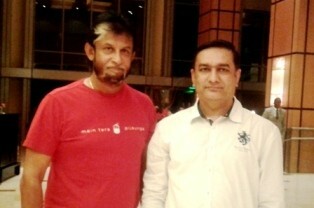 Dr. Ghanta Vijay Kumar, Principal, A.K.R.G. 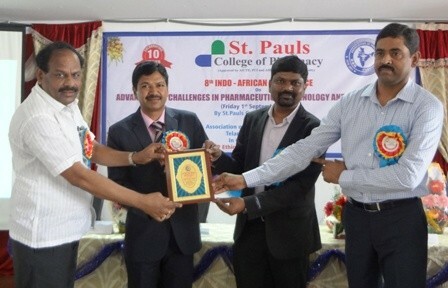 College of Pharmacy, Nallajerla; Prof. A. Prameela Rani, Principal, University College of Pharmaceutical Sciences, Acharya Nagarjuna University, Guntur; Dr. Jaya Raju, Principal, Adarsa College of Pharmacy, G. Kothapalli; Dr. I. Sudheer Babu, Principal, Sir CR Reddy College of Pharmaceutical Sciences, Eluru; Mr. A. Kishore Babu, Principal, DCRM Pharmacy College, Inkollu; Dr. Balagant Pavan Kumar, Principal, Gokul Krishna College of Pharmacy, Sullurpet; Dr. P. Rambabu, Principal, Nrk & Ksr Gupta college of Pharmacy, Tenali; Dr. S. Govindarajan, Principal, Hindu College of Pharmacy, Guntur; Dr. K.Venkata Ramana, Principal, ASN Pharmacy College, Tenali; Dr. Appa Rao, Principal, Victoria Pharmacy College, Guntur; Dr M. Prasad Rao, Principal, M.A.M. 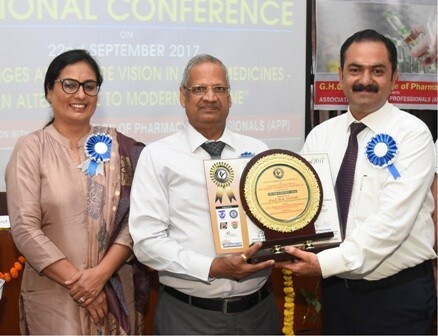 College of Pharmacy, Narasaraopet; Dr. J. N. Suresh Kumar, Principal, Narasaraopet Institute of Pharmaceutical Sciences, Narasaraopet; Dr. S. Vidyadhara, Principal, Chebrolu Hanuaiah Institute of Pharmaceutical Sciences, Guntur; Dr. N. Sreekanth, Principal, Koringa College of Pharmacy, Korangi; Dr. S.K. 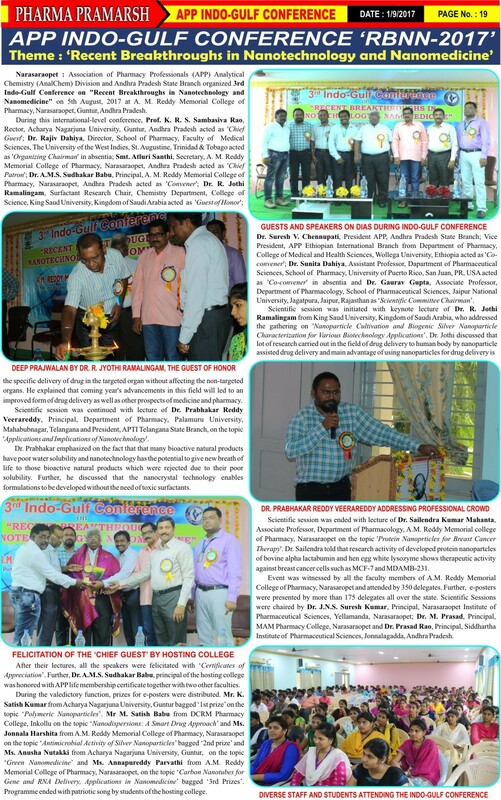 Abdul Rahaman, Principal, Nirmala Pharmacy College, Mangalagiri; Dr. Praveen Srikumar, Principal, St. Marys Pharmacy College, Chebrolu; Dr. A. Lakshmana Rao, Principal, V.V. 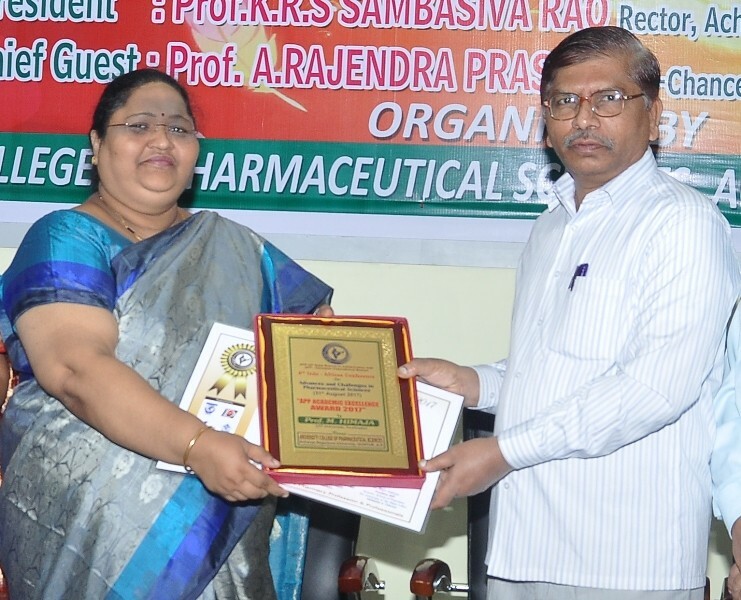 Institute of Pharmaceutical Science, Gudlavalleru; Dr. K. Padmalatha, Principal, Vijaya Institute of Pharmaceutical Sciences for Women, Vijayawada; Dr. S. Prasanna, Principal, M.L. 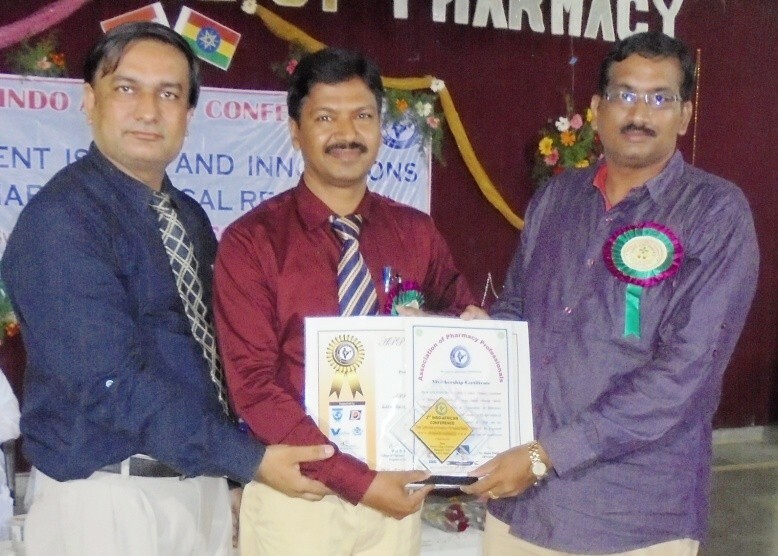 Pharmacy College, Singarayakonda; Dr. K. S. Natraj, Professor, Vishnu Pharmacy College, Bhimavaram and Dr. S. Gananadhamu, Asst. Professor, NIPER, Hyderabad. 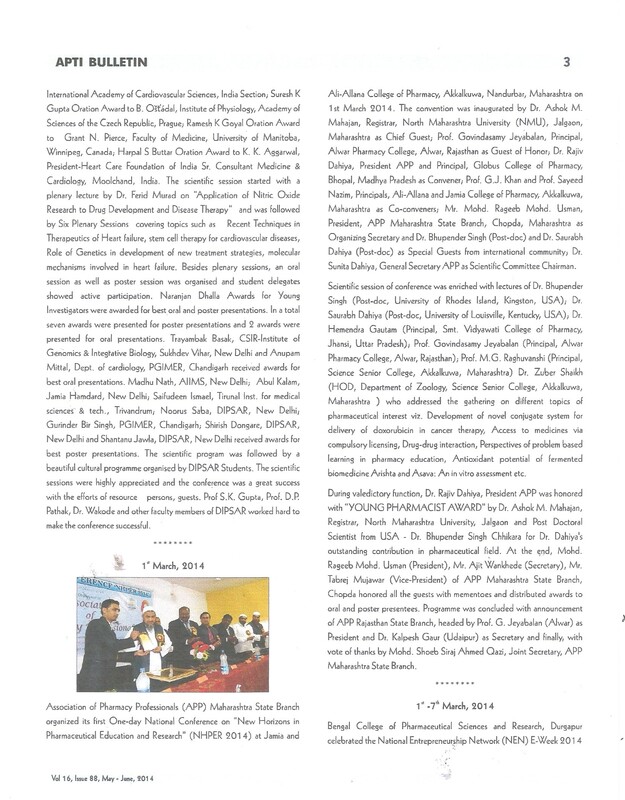 During the valedictory function, certificates of appreciation were presented to Dr. S. D. Gupta, Dr. S. K. Puri, Dr. Nirmal Gurbani and Dr. Saurabh Kumar Banerjee by Dr. Suresh V. Chennupati, President, APP AP State Branch. 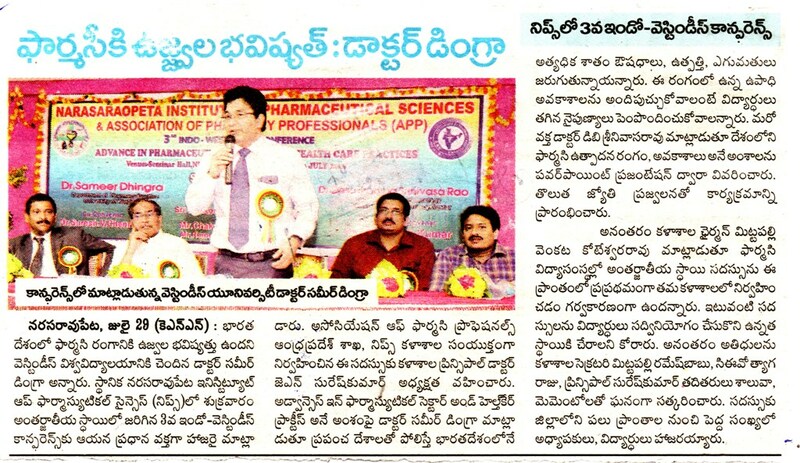 Association of Pharmacy Professionals (APP) Andhra Pradesh State Branch organized 2nd Indo-Korean Conference on ‘Herbals and Pharmaceuticals: Pivotal Issues and Concerns’ on 30th March, 2016 at Gokula Krishna College of Pharmacy, Sullurpet, Nellore, Andhra Pradesh. For this conference, Dr. Rajiv Dahiya, President, Association of Pharmacy Professionals (India) acted as ‘Organizing Chairman’ in absentia. 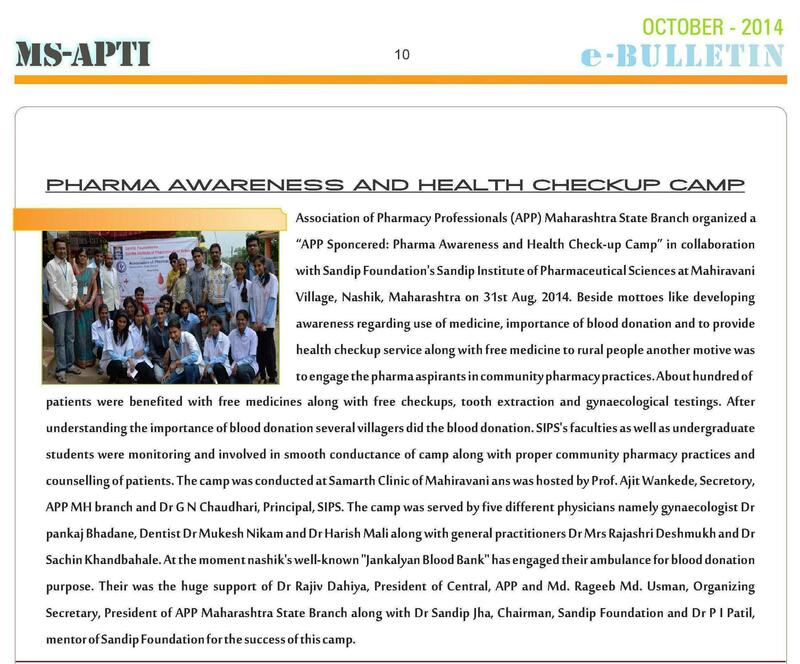 Further, event was witnessed by Sri G. Brahmaiah, President, Gokula Krishna College of Pharmacy, Sullurpet, Andhra Pradesh as ‘Patron’; Dr. Pavan Kumar Balagani, Principal of hosting college and Dr. Sunita Dahiya, General Secretary, Association of Pharmacy Professionals, Bhopal, Madhya Pradesh as ‘Conveners’; Dr. Suresh V. Chennupati, President, APP Andhra Pradesh State Branch as ‘Co-convener’. Scientific session was initiated with keynote lecture of Dr. Deepak Kumar from School of Natural Sciences, Changwon National University, Changwon, Republic of Korea, who addressed the gathering on ‘Design and synthesis of natural product catechin analogues for its biological activity’. 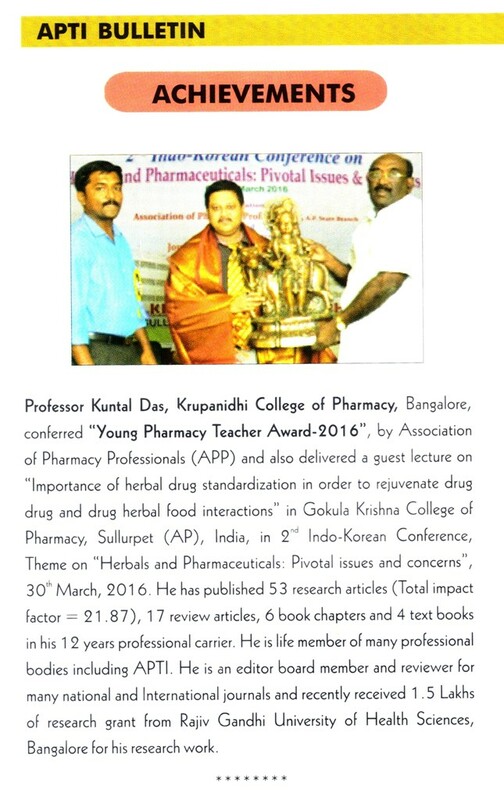 Another lecture was delivered by Dr. Kuntal Das, Associate Professor, Department of Pharmacogosy and Phytomedicine, Krupanidhi College of Pharmacy, Bangalore on the topic ‘Importance of herbal drug standardization in order to rejuvenate drug-drug and drug-herbal food Interaction’. 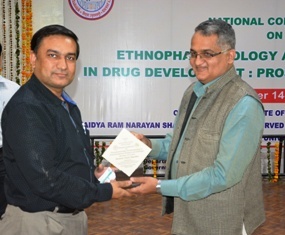 Session was terminated with lecture by Dr. S. Gananadhamu, Assistant Professor, National Institute of Pharmaceutical Education and Research (NIPER), Hyderabad on the topic of ‘Impurity profiling of pharmaceuticals’. 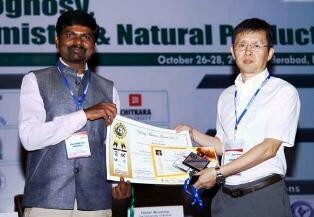 For his outstanding contribution in pharmaceutical research, Dr. Deepak Kumar from Changwon National University, Changwon, South Korea was honored with “APP Young Investigator Award 2016” (Late Smt. 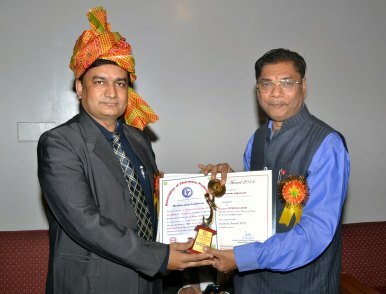 Khazani Devi Memorial Award) by Dr. Kuntal Das, President, APP Karnataka State Branch. 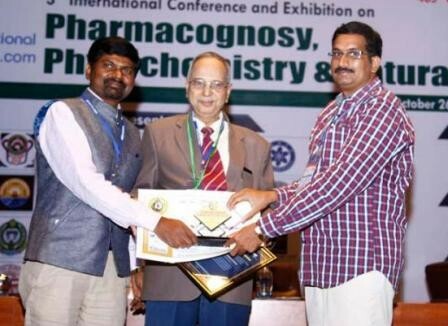 Further, for his vital contribution in pharmaceutical education, Dr. Kuntal Das, Associate Professor, Department of Pharmacogosy and Phytomedicine, Krupanidhi College of Pharmacy, Bangalore was conferred with “APP Young Pharmacy Teacher Award 2016” (Late Smt. 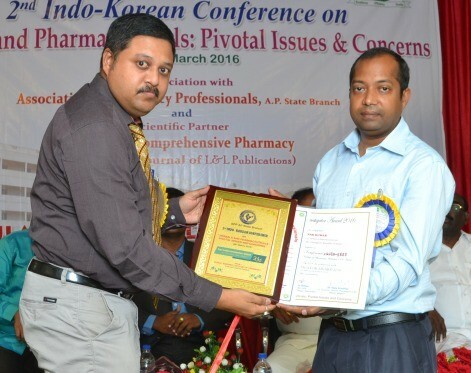 Shyam Sundri Dahiya Memorial Award) by Dr. Praveen Kumar, Principal, Gokula Krishna College of Pharmacy, Sullurpet, Nellore, Andhra Pradesh. 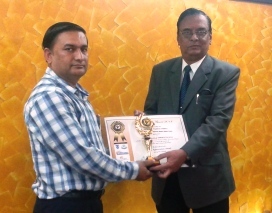 Moreover, Dr. S. Gananadhamu, Assistant Professor, National Institute of Pharmaceutical Education and Research (NIPER), Hyderabad, Telangana was conferred with ‘APP Young Talent Award 2016’ (Late Ch. 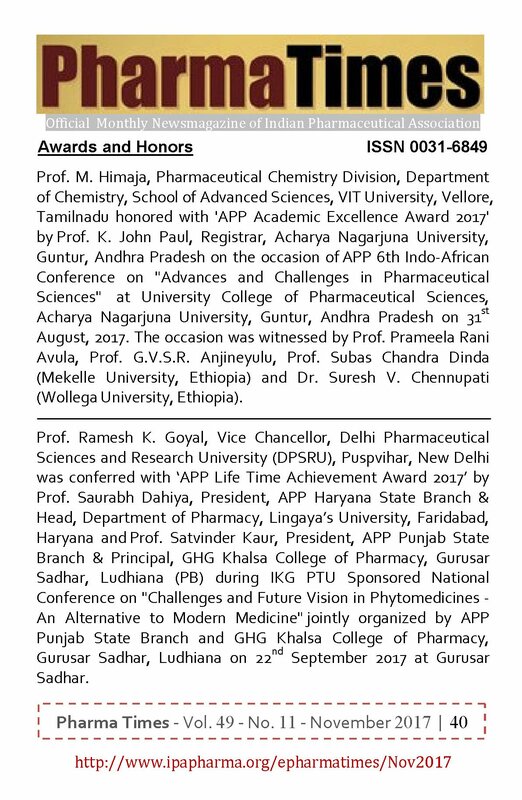 Braham Datt Dahiya Memorial Award) by Dr. Suresh V. Chennupati, President, Association of Pharmacy Professionals, Andhra Pradesh State Branch for his vital contribution in pharmaceutical research. 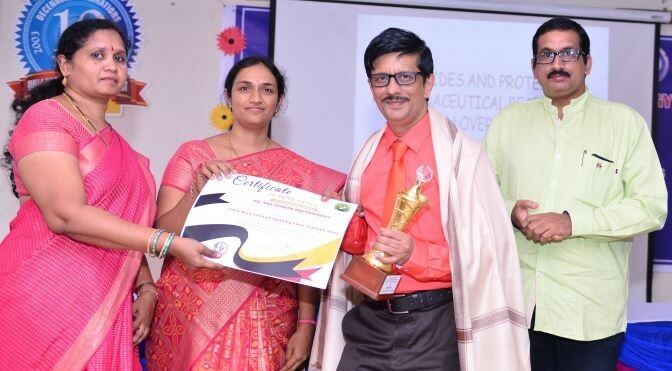 Moreover, Mr. Deepak Kumar, Associate Professor, Department of Pharmacognosy, Gokula Krishna College of Pharmacy, Sullurupet, Nellore, Andhra Pradesh was honored with ‘Best Teacher Award 2016’ and Ms. Papareddy Santhi, B.Pharm Student of Gokula Krishna College of Pharmacy, Sullurpet was conferred with ‘Best Student Award 2016’. 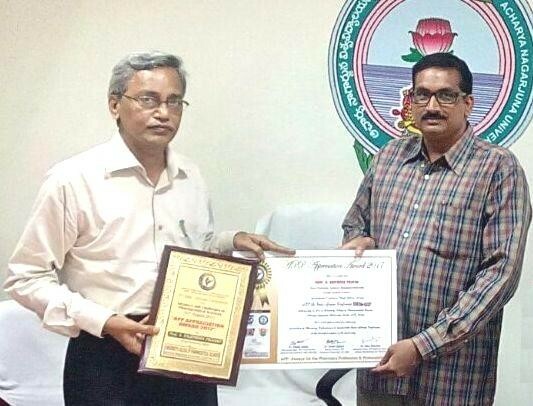 At the end, President and Principal of Gokula Krishna College of Pharmacy, Sullurpet, Andhra Pradesh were conferred with ‘APP Appreciation Awards’. 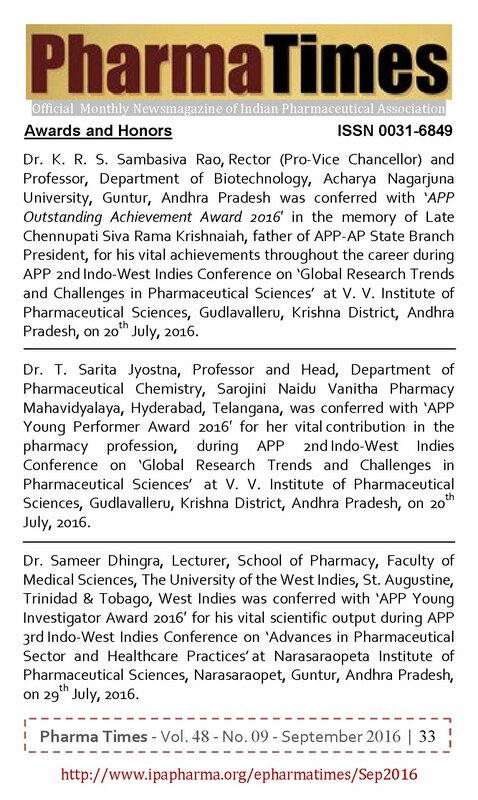 Association of Pharmacy Professionals (APP) Andhra Pradesh State Branch organized 2nd Indo-West Indies Conference on ‘Global Research Trends and Challenges in Pharmaceutical Sciences’ on July 20, 2016 at V. V. Institute of Pharmaceutical Sciences, Gudlavalleru, Krishna District, Andhra Pradesh. 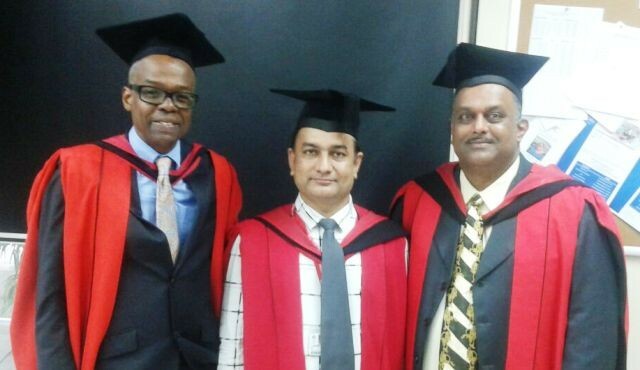 Event was witnessed by Prof. K. R. S. Sambasiva Rao, Rector (Pro-Vice Chancellor), Acharya Nagarjuna University, Guntur as ‘Chief Guest’; Dr. Madan Mohan Gupta, Senior Lecturer (Pharmaceutics), School of Pharmacy, Faculty of Medical Sciences, The University of the West Indies, Trinidad & Tobago as ‘Guest of Honor’; Dr. Nageswara Rao Vallurapalli, Chairman, V. V. Institute of Pharmaceutical Sciences as ‘Patron’; Dr. A. Lakshman Rao, Principal, V. V. Institute of Pharmaceutical Sciences, Andhra Pradesh as ‘Convener’; Dr. Suresh V. Chennupati, President, APP Andhra Pradesh State Branch and Principal, K. C. Reddy Institute of Pharmaceutical Sciences, Guntur, Andhra Pradesh as ‘Co-convener’ and Dr. Rajiv Dahiya, President APP and Director, School of Pharmacy, Faculty of Medical Sciences, The University of the West Indies, Trinidad & Tobago as ‘Organizing Chairman‘ and Dr. Sunita Dahiya, General Secretary, APP as ‘Scientific Committee Chairman‘ in absentia. Inauguration was initiated by welcome of all the guests on the dias with bouquet of flowers followed by lightening of the lamp and prayer song. Scientific session was initiated with lecture of Dr. T. Sarita Jyostna, Professor and Head, Department of Pharmaceutical Chemistry, Sarojini Naidu Vanitha Pharmacy Mahavidyalaya, Hyderabad, Telangana, who addressed the gathering on ‘Chemotherapeutics: Brassinin and its derivatives‘. She emphasized on the significance, isolation and synthesis in low cost and its therapeutic uses. 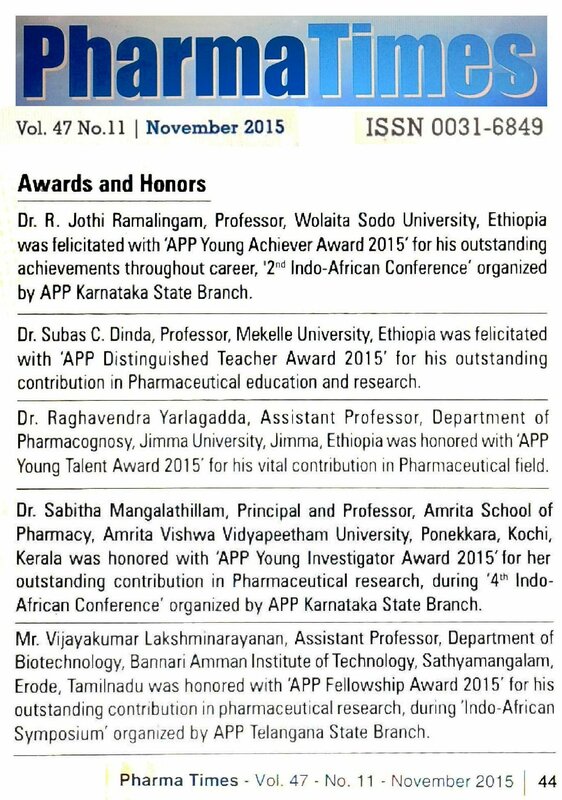 Dr. Sarita was conferred with ‘APP Young Performer Award 2016′ for her vital contribution in the pharmacy profession. Scientific session was continued with lecture of Dr. Madan Mohan Gupta from The University of the West Indies, on the topic ‘Spherical crystallization: A technique useful for converting amorphous powder into crystals‘. 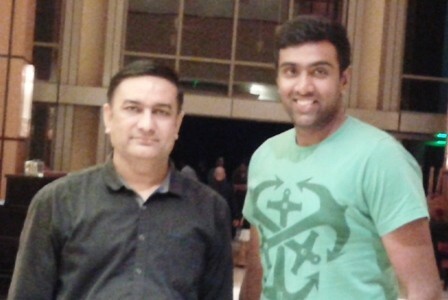 He discussed about the technique of preparation of spherical crystals and also flaws in the present system of pharmacy education and how to overcome it. Another invited talk was given by Prof. K. R. S. Sambasiva Rao, Rector and Head, Department of Biotechnology, Acharya Nagarjuna University, Guntur (A.P.) on the topic ‘Production of biopharmaceuticals using animal cell culture’. Dr. Sambasiva Rao was conferred with ‘APP Outstanding Achievement Award 2016′ in the memory of Late Chennupati Siva Rama Krishnaiah, father of APP-AP State Branch President, for his vital achievements throughout the career. Conference was attended and papers were presented in ‘poster’ session by more than 250 delegates from different universities and institutions all over south India. 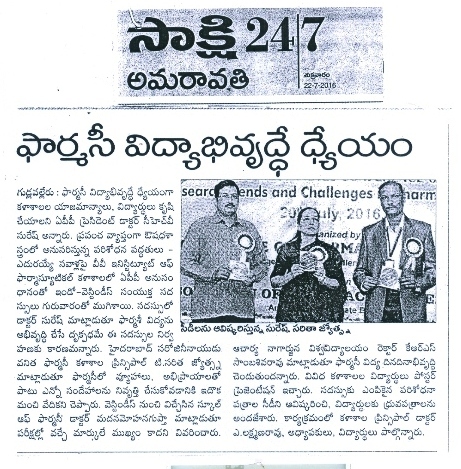 Dr. Rajya Lakshmi from Vignan Pharmacy College, Vadlamudi and Dr. Venkateswara Rao from Aditya Pharmacy College, Surampalem, East Godavari District acted as ‘Judges’ for the scientific poster session during the APP 2nd Indo-West Indies Conference. 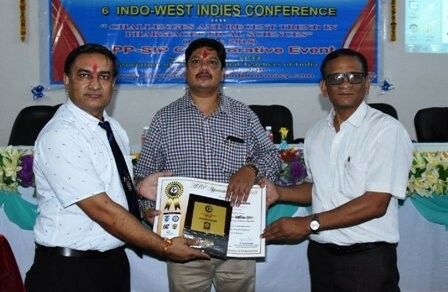 During the valedictory function, Dr. Madan Mohan Gupta, Senior Lecturer (Pharmaceutics), School of Pharmacy, Faculty of Medical Sciences, The University of the West Indies; Dr. A. Lakshman Rao, Principal and Professor, V. V. Institute of Pharmaceutical Sciences, Gudlavalleru were conferred with ‘APP Appreciation Awards’. Dr. T. Sarita Jyostna was nominated as ‘Secretary‘ for APP Telanagna State Branch 2016. 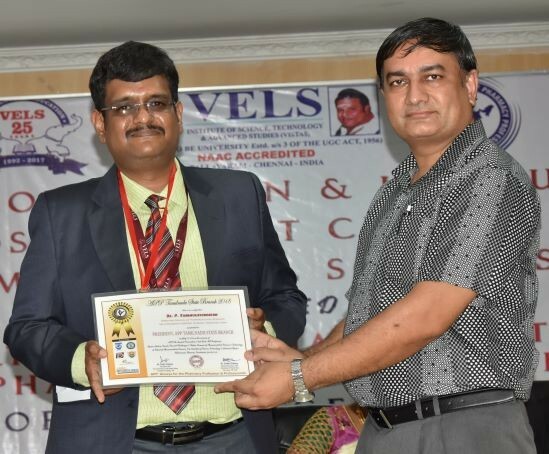 Dr. Jithan Venkata Aukunuru was promoted to Vice President, APP Telangana State Branch and the certificate was presented by President, APP AP State Branch during the valedictory function of the conference. At the end, Ms. S. Vidya Sree from Vignan Pharmacy College, Vadlamudi; Mr. D. Santhosh Kumar, K.V.S.R. 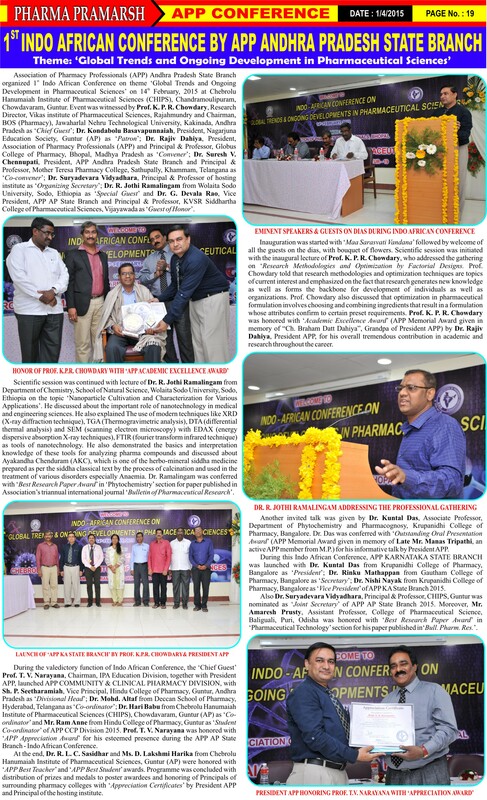 Siddhartha College of Pharmaceutical Sciences, Vijayawada; Mr. J. V. U. S. Chakradhar, V. V. Institute of Pharmaceutical Sciences, Gudlavalleru; Mr. Sk. Mujafar, K.C. 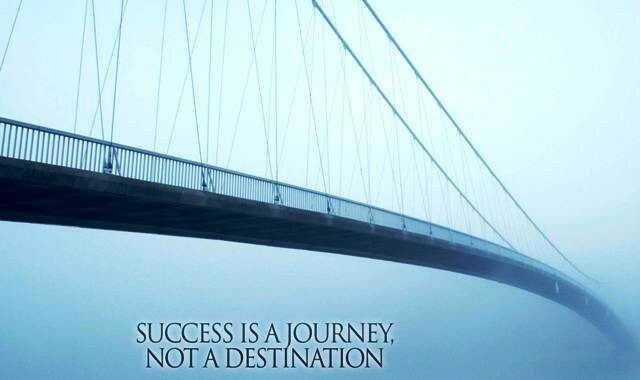 Reddy Institute of Pharmaceutical Sciences, Guntur; Ms. Ch. 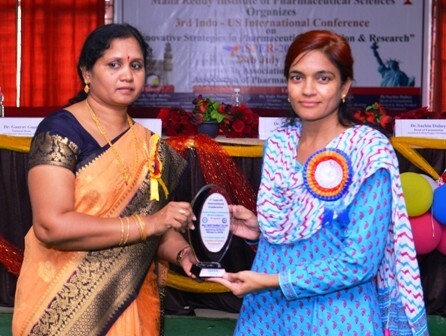 Neelima, Vignan Pharmacy College, Vadlamudi and Ms. K. Jaya Bharathi,V. 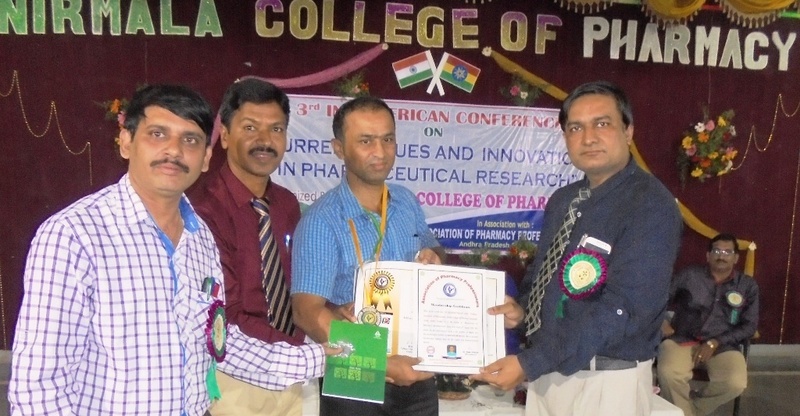 V. Institute of Pharmaceutical Sciences, Gudlavalleru bagged 1st and 2nd positions in poster presentation competition. Also, consolation prizes were given to Mr. P. Sridhar, Department of Chemistry, VIT University, Vellore and Ms. D. Sunanda, K. C. Reddy Institute of Pharmaceutical Sciences, Guntur, Andhra Pradesh. 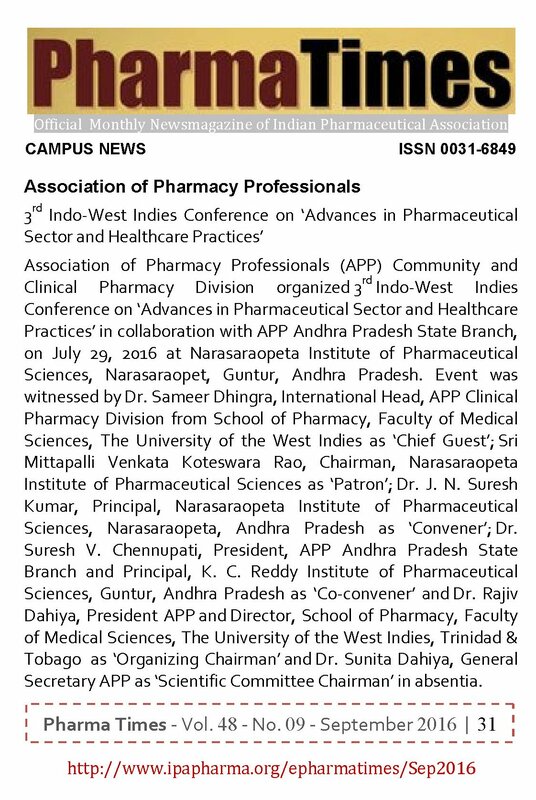 Association of Pharmacy Professionals (APP) Andhra Pradesh State Branch and APP Community and Clinical Pharmacy Division organized 3rd Indo-West Indies Conference on ‘Advances in Pharmaceutical Sector and Healthcare Practices’ on July 29, 2016 at Narasaraopeta Institute of Pharmaceutical Sciences, Narasaraopet, Guntur, Andhra Pradesh. 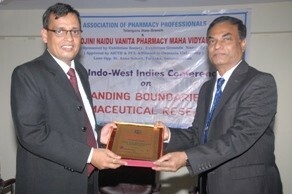 Event was witnessed by Dr. Sameer Dhingra, International Head, APP Clinical Pharmacy Division from School of Pharmacy, Faculty of Medical Sciences, The University of the West Indies as ‘Chief Guest’; Sri Mittapalli Venkata Koteswara Rao, Chairman, Narasaraopeta Institute of Pharmaceutical Sciences as ‘Patron’; Dr. J. N. Suresh Kumar, Principal, Narasaraopeta Institute of Pharmaceutical Sciences, Narasaraopeta, Andhra Pradesh as ‘Convener’; Dr. Suresh V. Chennupati, President, APP Andhra Pradesh State Branch and Principal, K. C. Reddy Institute of Pharmaceutical Sciences, Guntur, Andhra Pradesh as ‘Co-convener’ and Dr. Rajiv Dahiya, President APP and Director, School of Pharmacy, Faculty of Medical Sciences, The University of the West Indies, Trinidad & Tobago as ‘Organizing Chairman’ and Dr. Sunita Dahiya, General Secretary APP as ‘Scientific Committee Chairman’ in absentia. Programme was initiated by welcome of all the guests on the dias with bouquet of flowers followed by lightening of the lamp and traditional dance. Scientific session was initiated with lecture of Dr. Sameer Dhingra from School of Pharmacy, Faculty of Medical Sciences, The University of the West Indies, who addressed the gathering on ‘Clinical Pharmacy Practice and Education in India: A Global Prospective’. He emphasized on the needs for clinical pharmacy services, current global trends, challenges and opportunities ahead in improving patient care. 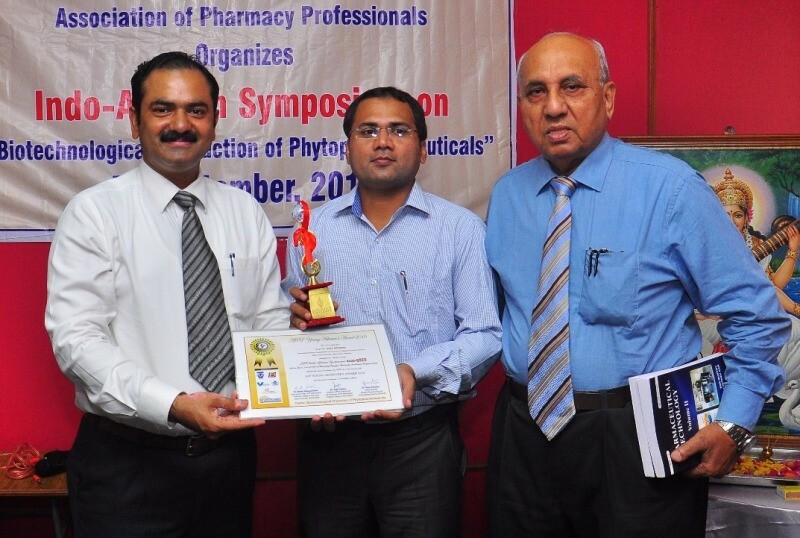 Dr. Dhingra was conferred with ‘APP Young Investigator Award 2016′ for his vital scientific contribution in the pharmacy profession. Scientific session was continued with lecture of Dr. Desu Brahma Srinivasa Rao, Head, Department of Pharmacology, Hndu Pharmacy College, Guntur, Andhra Pradesh, on the topic ‘Innovation in the Pharmaceutical Industry and Clinical Pharmacy Services for Better Health’. 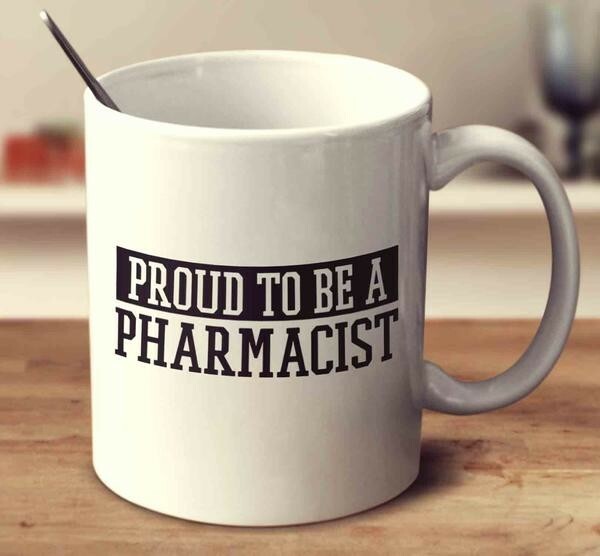 He discussed about clinical pharmacy services performed by pharmacists practicing in hospitals, community pharmacies, nursing homes, home-based care services and clinics. Conference was attended and participated by more than 250 delegates from different universities and institutions all over South India, including Dr. M. V. Nagabhushanam from Hindu Pharmacy College, Guntur; Dr. Sudhakar Babu from A. M. Reddy Pharmacy College, Narasaraopeta. 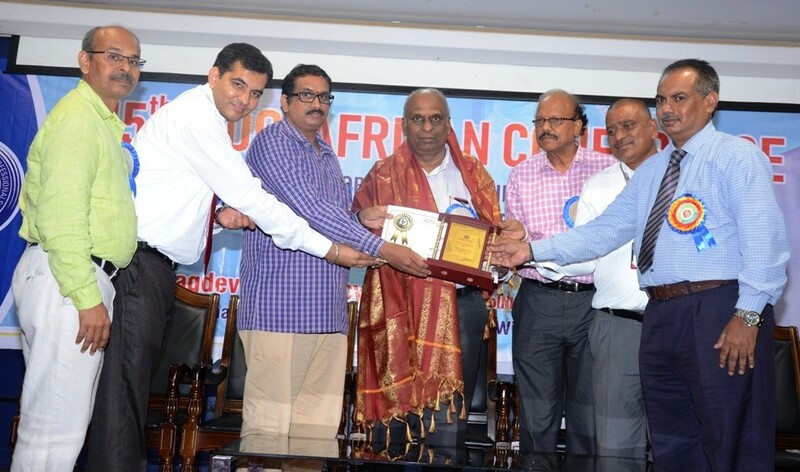 During the valedictory function, Sri Mittapalli Venkata Koteswara Rao, Chairman, Narasaraopeta Institute of Pharmaceutical Sciences and Dr. J. N. Suresh Kumar, Principal, Narasaraopeta Institute of Pharmaceutical Sciences, Andhra Pradesh were conferred with ‘APP Appreciation Awards’. 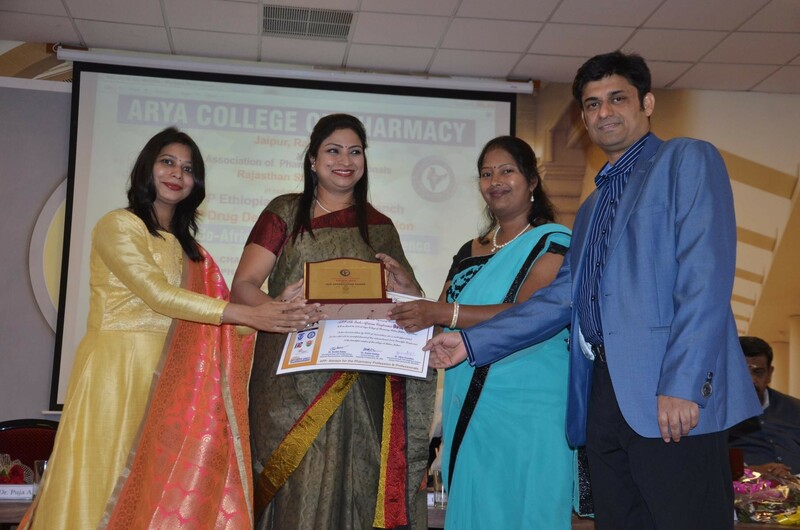 At the end, Ms. Kolapalli Sai Venkata Nikitha, Pharm D. Student and Ms. Kalluri Alekhya, B. Pharmacy student of Narasaraopeta Institute of Pharmaceutical Sciences, Narasaraopeta were conferred with ‘Best Student Awards’ by Dr. Sameer Dhingra, International Head, APP Clinical Pharmacy Division. 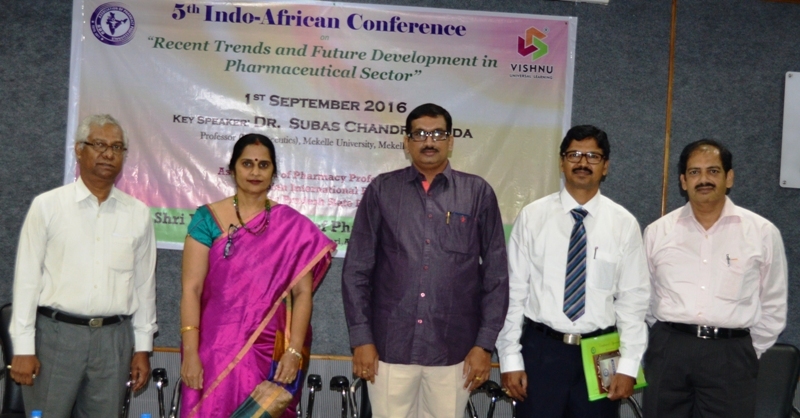 Association of Pharmacy Professionals (APP) Andhra Pradesh State Branch and APP Ethiopian International Branch organized 5th Indo-African Conference on ‘Recent Trends and Future Development in Pharmaceutical Sector’ on 1st September, 2016 at Shri Vishnu College of Pharmacy, Bhimavaram, West Godavari, Andhra Pradesh. Event was witnessed by Dr. Subas Chandra Dinda from Mekelle University, Ethiopia as ‘Chief Guest’; Sh. K. V. Vishnu Raju, Chairman, Shri Vishnu Educational Society, Bhimavaram, Andhra Pradesh as ‘Chief Patron‘; Dr. Suresh V. Chennupati, President, APP Andhra Pradesh State Branch, Guntur, Andhra Pradesh as ‘Convener’; Dr. D. B. Raju, Director and Professor, Shri Vishnu College of Pharmacy, Bhimavaram, West Godavari, Andhra Pradesh as ‘Co-convener’; Dr. K. Prasad, Principal and Professor, Shri Vishnu College of Pharmacy, Bhimavaram, West Godavari, Andhra Pradesh as ‘Organizing Secretary’. 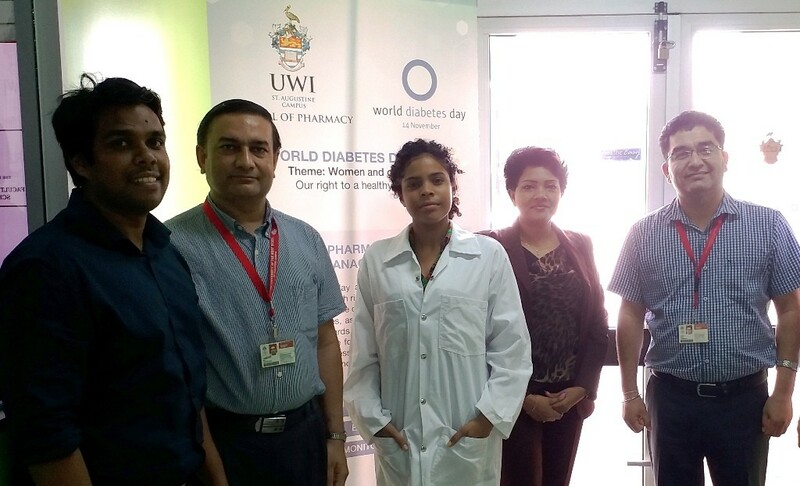 Further, Dr. Rajiv Dahiya, President APP and Director, School of Pharmacy, Faculty of Medical Sciences, The University of the West Indies, St. Augustine, Trinidad & Tobago acted as ‘Organizing Chairman’ and Dr. Sunita Dahiya, General Secretary APP acted as ‘Chairman-Scientific Committee’ of the conference in absentia. Inauguration was started with ‘Prayer’ followed by welcome of all the guests on the dias with bouquet of flowers. 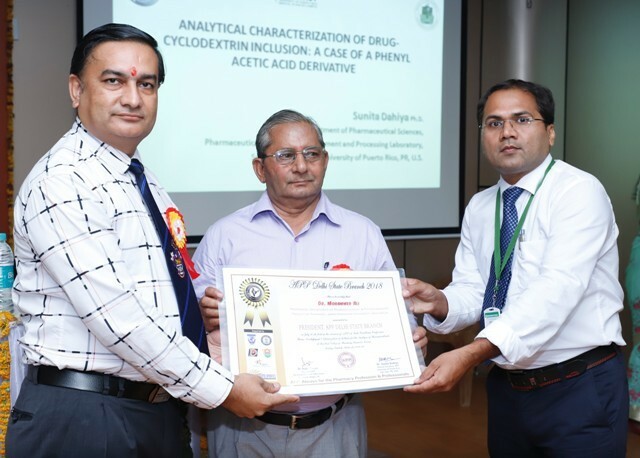 Scientific session was initiated with keynote lecture of Dr. P. K. Lakshmi, Professor and Head, Department of Pharmaceutics, G. Pulla Reddy College of Pharmacy, Hyderabad who addressed the gathering on ‘ADME of Polymer Therapeutics’. 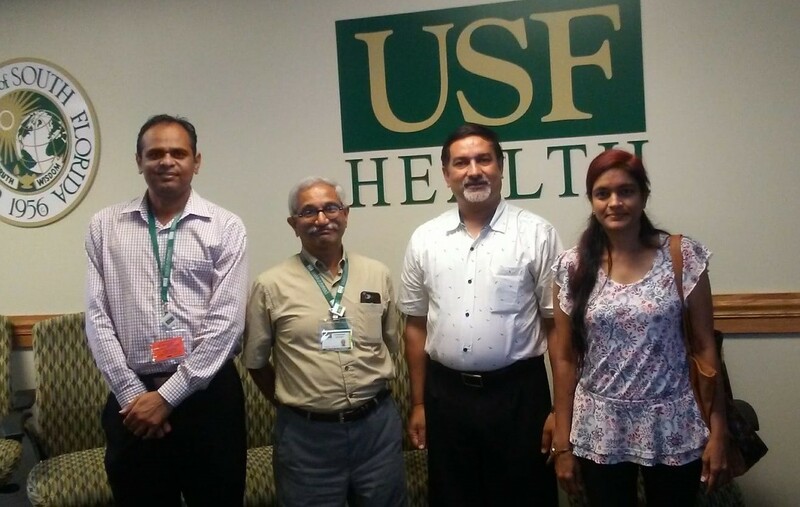 Dr. Lakshmi discussed that understanding the pharmacokinetics of polymers in every step in the formulation of a polymer conjugates may prove successful drug delivery system in vivo and may avoid the iatrogenic illness. She told that polymer conjugation is an efficient approach to deliver the drugs to the host at specified target site without causing host toxicity or immunogenic reactions. Scientific session was continued with lecture of Dr. Subas Chandra Dinda, Professor of Pharmaceutics, College of Health Sciences, Mekelle University, Mekelle, Ethiopia on the topic ‘Mucoadhesive Microcapsule: A Novel Approach in Controlled and Sustained Drug Delivery’. Dr. Dinda emphasized on the rationale behind the designing of mucoadhesive dosage forms, the targeting sites of mucoadhesive drug delievery systems, approaches followed to incorporate drugs into the bioadhesive polymers, techniques used for preparation of mucoadhesive micro particles etc. Scientific Session was ended with lecture of Dr. Suresh V. Chennupati, President, APP AP State Branch on the topic ‘Pharmacy Education and Practice in India: Challenges and Opportunities Ahead’. Dr. Suresh highlighted the importance of quality education and its outputs in the long term for academic, industrial and clinical side. Conference was attended and papers were presented both in ‘oral’ and ‘poster’ session by more than 200 delegates all over the state. 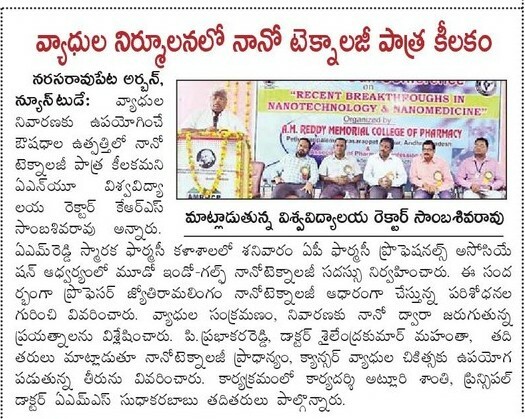 Event was witnessed by all the faculty members of Shri Vishu College of Pharmacy, Bhimavaram including Dr. M. Mohan Varma, Dr. A. Srinivasa Rao, Dr. K. S. Natraj, Dr. Raghu Prasad and Dr. Swamy. During the valedictory function, Dr. K. Prasad, Principal, Shri Vishnu College of Pharmacy, Bhimavaram was conferred with ‘APP Appreciation Award’ by Dr. Suresh V. Chennupati, President, APP Andhra Pradesh State Branch. Programme ended with vote of thanks by Ms. K. Sindhu Bharathi, B. Pharmacy (final year) student of the hosting college. 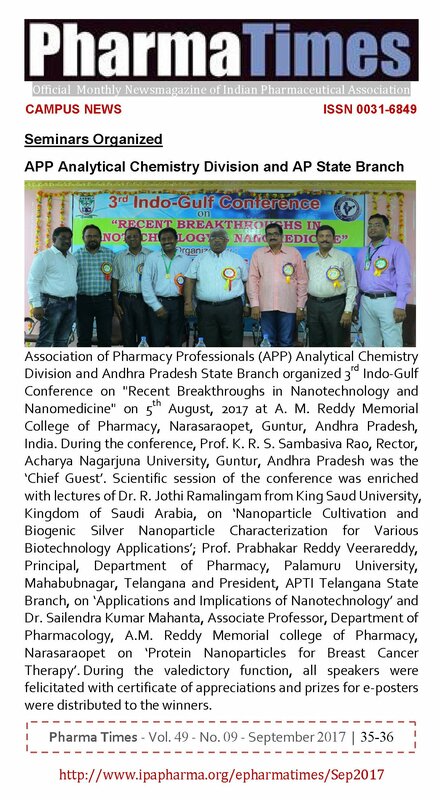 Association of Pharmacy Professionals (APP) Andhra Pradesh State Branch and APP Community Clinical Pharmacy & Biotech Division organized 2nd Indo-Gulf Conference on ‘Nanotechnology: From Basic Research to Nanomedicines’ on 2nd September, 2016 at Shri Vishnu College of Pharmacy, Bhimavaram, West Godavari, Andhra Pradesh. 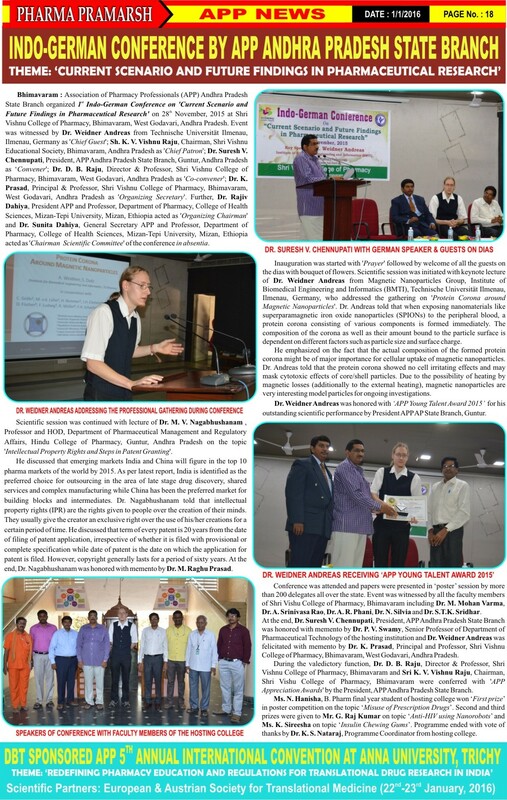 Event was witnessed by Dr. Bhakti Bhusan Barik from Jazan University, Jazan, Saudi Arabia as ‘Guest of Honour’, Prof. D. Satyanarayana, Professor Emeritus, Vikas Institute of Pharmaceutical Sciences, Rajahmundry, Andhra Pradesh as ‘Chief Guest’; Sh. K. V. Vishnu Raju, Chairman, Shri Vishnu Educational Society, Bhimavaram, Andhra Pradesh as ‘Chief Patron’; Dr. Suresh V. Chennupati, President, APP Andhra Pradesh State Branch, Guntur, Andhra Pradesh as ‘Convener‘; Dr. D. B. Raju, Director & Professor, Shri Vishnu College of Pharmacy, Bhimavaram, West Godavari, Andhra Pradesh as ‘Co-convener’; Dr. K. Prasad, Principal and Professor, Shri Vishnu College of Pharmacy, Bhimavaram, West Godavari, Andhra Pradesh as ‘Organizing Secretary‘. 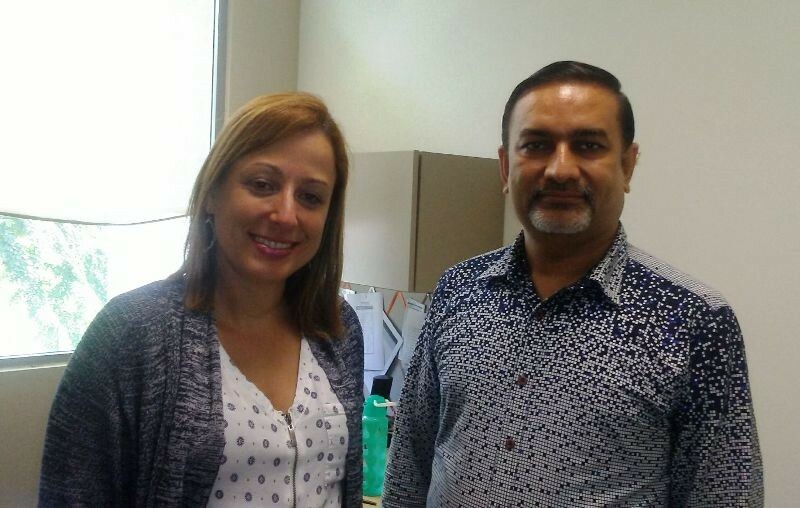 Further, Dr. Rajiv Dahiya, President APP and Director, School of Pharmacy, Faculty of Medical Sciences, The University of the West Indies, St. Augustine, Trinidad & Tobago acted as ‘Organizing Chairman’ and Dr. Sunita Dahiya, General Secretary APP acted as ‘Chairman-Scientific Committee’ of the conference in absentia. Scientific session was initiated with keynote lecture of Prof. Bhakti Bhusan Barik from College of Pharmacy,Jazan University, Jazan, Saudi Arabia, who addressed the gathering on ‘Nanotechnology Based Drug Delivery Systems’. Prof. Barik discussed that several researches in nanotechnology based drug delivery systems have been designed to overcome the challenges through the development and fabrication of nanostructures/nanoparticles. He told that the nanotechnology enables the delivery of drugs that are poorly water soluble and can provide means of bypassing the liver, thereby preventing the first pass metabolism and definitely promises to serve as drug delivery carrier of choice for the more challenging conventional drugs used for the treatment and management of chronic diseases such as cancer, asthma, hypertension, HIV and diabetes. 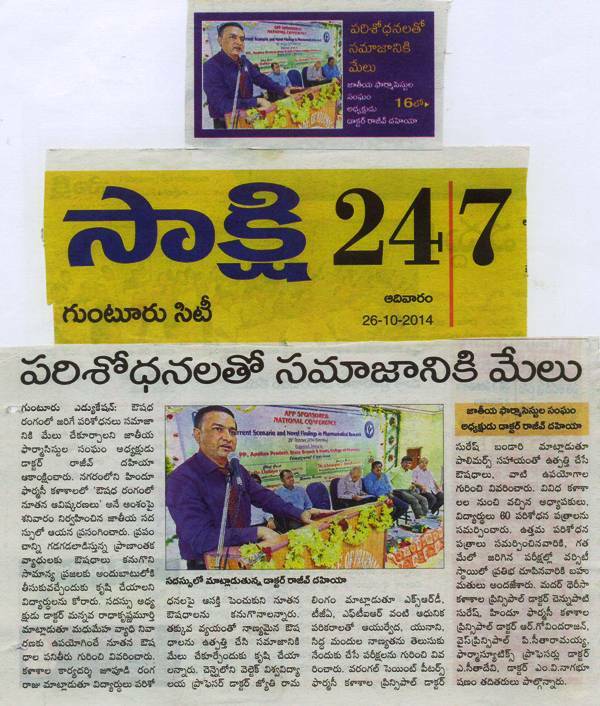 Scientific session was continued with lecture of Dr. D. Satyanarayana, Professor Emeritus, Vikas Institute of Pharmaceutical Sciences, Rajahmundry, Andhra Pradesh on the topic ‘Synthesis of Oils and Fats’. He emphasized on the fact that sustainable development had become the key ideal of the 21st century. In the search for sustainable chemistry, considerable importance is being attached to renewable raw materials which exploit the synthetic capabilities of nature. Oils and fats of vegetable and animal origin make up the greatest proportion of the current consumption of renewable raw materials in the chemical industry. 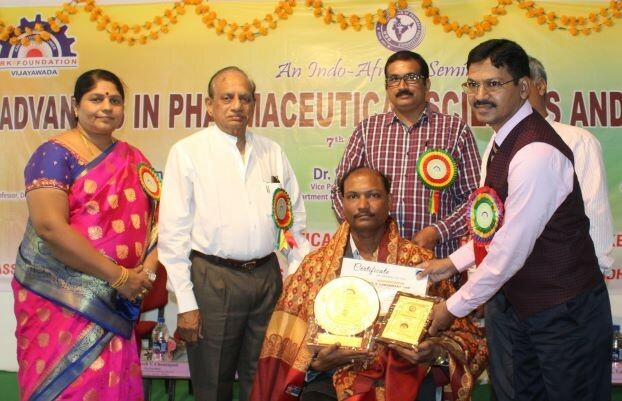 Dr. Satyanarayana was conferred with ‘APP Life Time Achievement Award 2016′ for his vital academic and scientific contribution in the pharmacy profession by Dr. B.B. 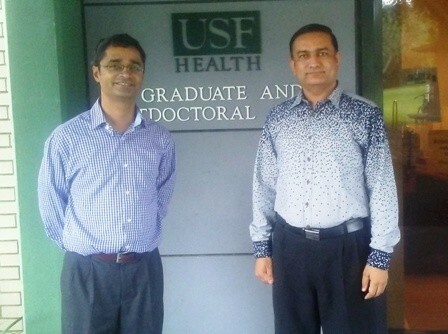 Barik, Professor, Jazan University, Saudi Arabia and Dr. Suresh V. Chennupati, President APP AP State Branch. 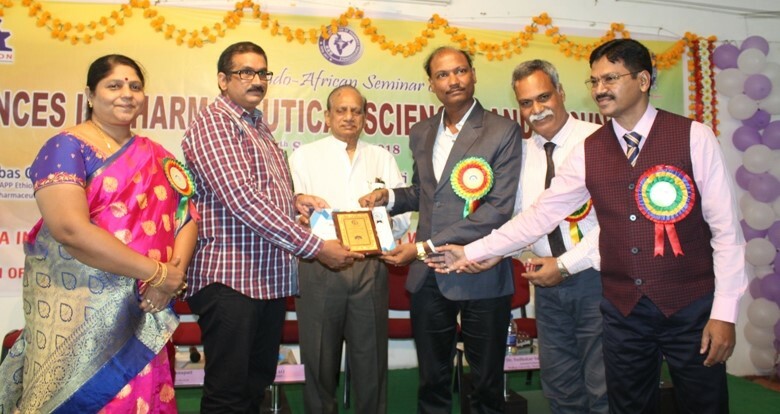 Scientific session was ended with lecture of Dr. A. Muralidhar Rao, Professor and Principal, Maheshwara Institute of Pharmacy, Patancheru, Hyderabad on the topic ‘Pharmaceutical Applications of Nanotechnology’. Dr. Muralidhar told that many bioactive natural products have poor water solubility and nanotechnology has the potential to give new breath of life to those bioactive natural products which were rejected due to their poor solubility. Further, he discussed that the nanocrystal technology enables formulations to be developed without the need of toxic surfactants which may cause enhanced side effects or adverse reactions. Conference was attended and papers were presented both in ‘oral’ and ‘poster’ session by more than 150 delegates all over the state. 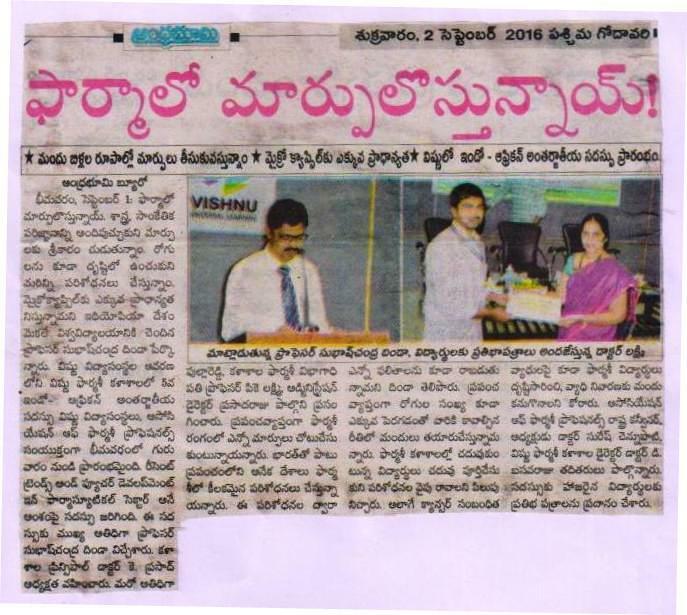 Event was witnessed by all the faculty members of Shri Vishu College of Pharmacy, Bhimavaram. 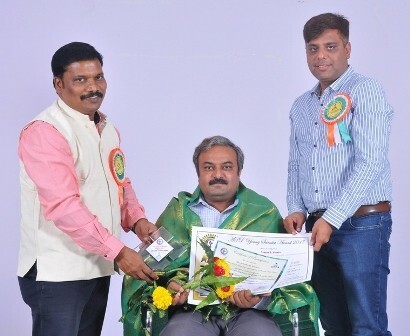 During the valedictory function, Dr. D. B. Raju, Director & Professor, Shri Vishnu College of Pharmacy, Bhimavaram was conferred with ‘APP Appreciation Award’ by Dr A. Muralidhar Rao, President, APP Telangana State Branch. Programme ended with vote of thanks by Mr. Rajani Shankar, Final year B. Pharmacy student from hosting college. 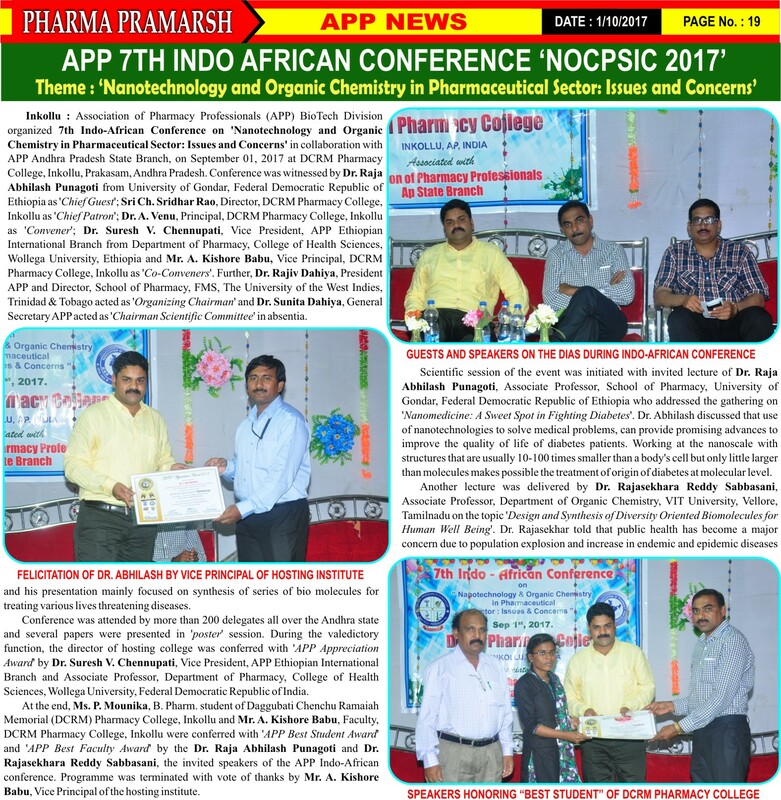 Association of Pharmacy Professionals (APP) Ethiopian International Branch organized 6th Indo-African Conference on ‘Advances and Challenges in Pharmaceutical Sciences’ in collaboration with APP Andhra Pradesh State Branch, on August 31, 2017 at University College of Pharmaceutical Sciences, Acharya Nagarjuna University, Guntur, Andhra Pradesh. 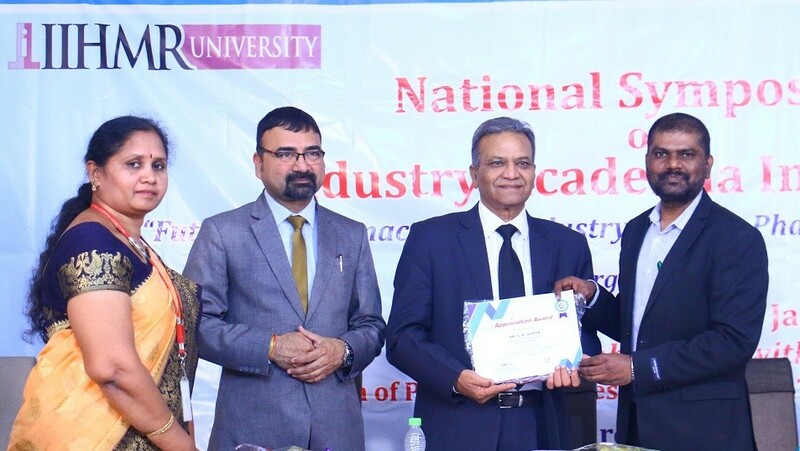 During this international level scientific conference, Prof. A. Rajendra Prasad, Vice Chancellor, Acharya Nagarjuna University acted as‘Chief Patron’; Prof. K.R.S. 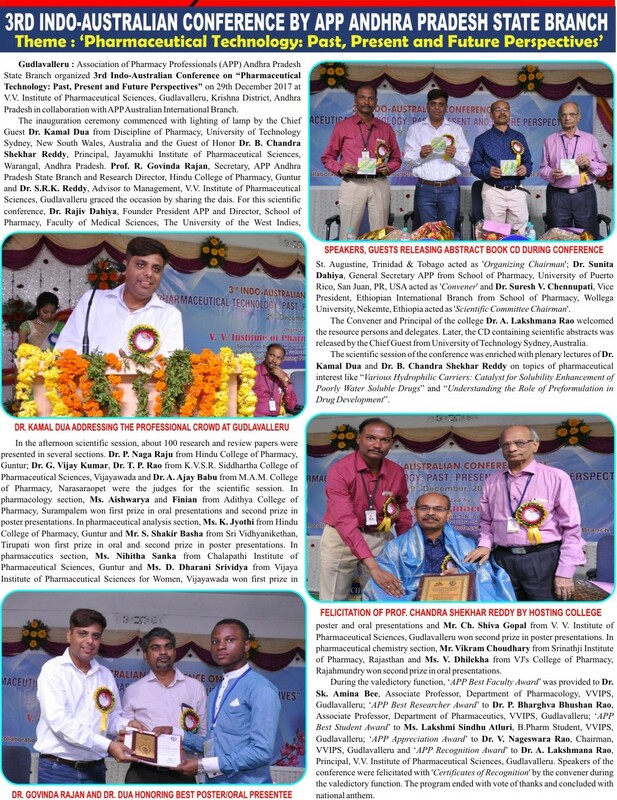 Sambasiva Rao, Rector, Acharya Nagarjuna University acted as‘Patron’; Prof. K. John Paul, Registrar, Acharya Nagarjuna University, Guntur acted as the ‘Chief Guest’; Dr. Rajiv Dahiya, President APP and Director, School of Pharmacy, Faculty of Medical Sciences, The University of the West Indies, Trinidad & Tobago acted as ‘Organizing Chairman’ in absentia; Prof. A. Prameela Rani, Principal, University College of Pharmaceutical Sciences, Acharya Nagarjuna University, Guntur, Andhra Pradesh acted as ‘Convener’; Dr. Suresh V. Chennupati, Vice President, APP Ethiopian International Branch and Associate Professor, Department of Pharmacy, College of Medical Sciences, Wollega University, Ethiopia acted as ‘Co-convener’ and Prof. G.V.S.R. 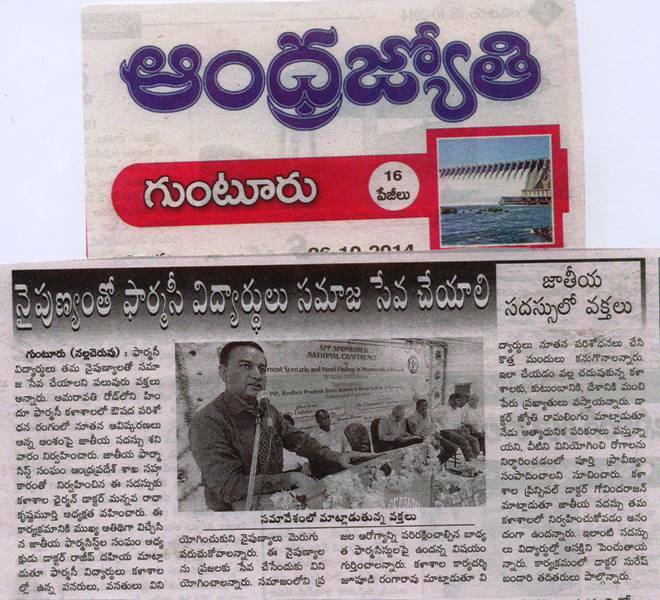 Anjineyulu, Director, International Student Cell, Acharya Nagarjuna University acted as ‘Guest of Honor’. Scientific session of the conference was enriched with lectures of Prof. Subas Chandra Dinda, President, APP Ethiopian International Branch from Department of Pharmaceutics, College of Medicine and Health Sciences, Mekelle University, Mekelle, Ethiopia, on the topic ‘Nanotechnology in Therapeutic Drug Targeting’ and Prof. M. Himaja fromDepartment of Chemistry, VIT University, Vellore, Tamilnadu on the topic ‘Edible Plant Extracts and their Biofabricated Silver Nano Particles as Alternative Medicine for Kidney Stones’. 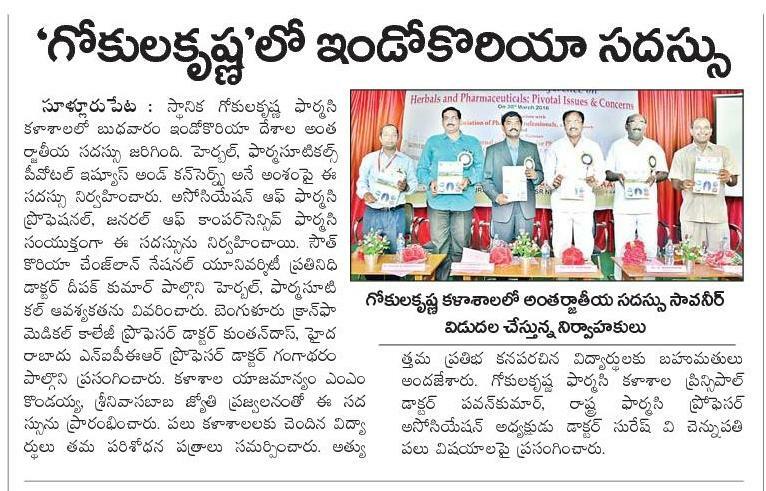 Conference was attended and participated by more than 300 delegates from different universities and institutions including Dr. Rama Krishna, Dr. Bharathi, Professors from K V S R Siddhartha College of Pharmaceutical Sciences, Vijayawada; Dr. A. Ravi Kumar from Bapatla Pharmacy College, Baptla, Guntur, Andhra Pradesh. During the valedictory function, Prof A. Rajendra Prasad, Prof. K.R.S. 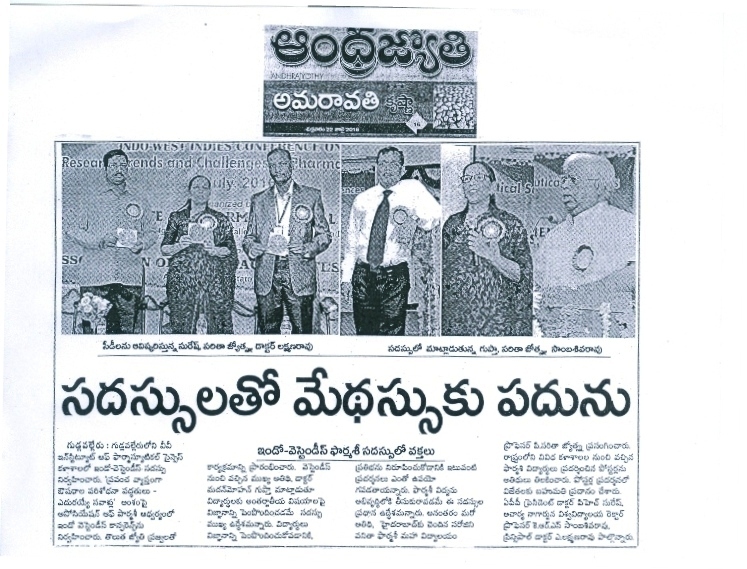 Sambasiva Rao and Prof. A. Prameela Rani were conferred with ‘APP Appreciation Awards’. 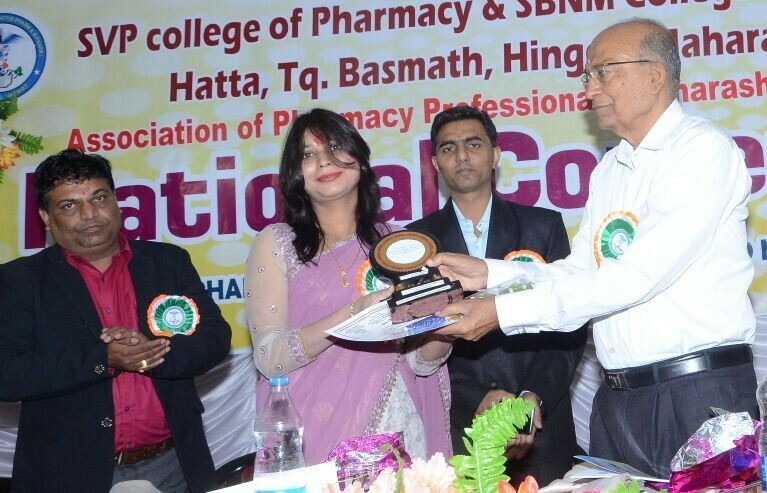 Programme ended with felicitation of Ms. P. Hema Naga Lakshmi, B. Pharm. 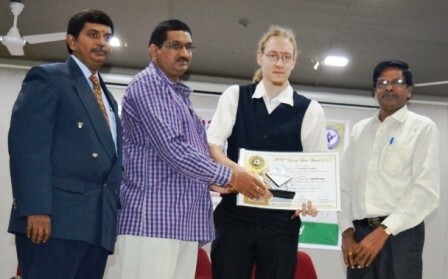 student, University College of Pharmaceutical Sciences, Acharya Nagarjuna University, Guntur with ‘APP Best Student Award’ by Prof. M. Himaja and Dr. Suresh V. Chennupati. 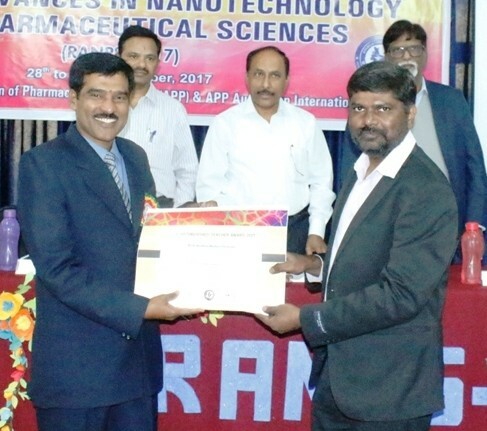 Association of Pharmacy Professionals (APP) BioTech Division organized 7th Indo-African Conference on ‘Nanotechnology and Organic Chemistry in Pharmaceutical Sector: Issues and Concerns’ in collaboration with APP Andhra Pradesh State Branch, on September 01, 2017 at DCRM Pharmacy College, Inkollu, Prakasam, Andhra Pradesh. Event was witnessed by Dr. Raja Abhilash Punagoti from University of Gondar, Federal Democratic Republic of Ethiopia as ‘Chief Guest’; Sri Ch. Sridhar Rao, Director, DCRM Pharmacy College, Inkollu as ‘Chief Patron‘; Dr. A. Venu, Principal, DCRM Pharmacy College, Inkolluas ‘Convener’; Dr. Suresh V. Chennupati, Vice President, APP Ethiopian International Branch and Associate Professor, Department of Pharmacy, College of Health Sciences, Wollega University, Ethiopia and Mr. A. Kishore Babu, Vice Principal, DCRM Pharmacy College, Inkollu as ‘Co-Convener’. 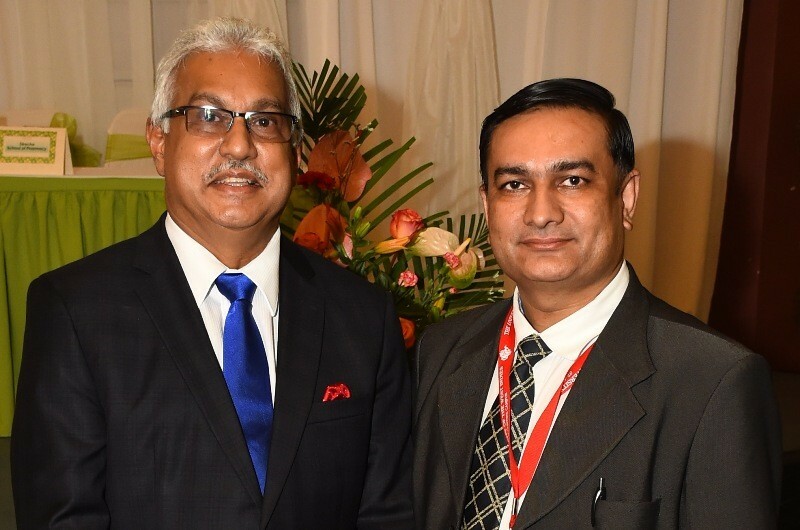 Further, Dr. Rajiv Dahiya, President APP and Director, School of Pharmacy, Faculty of Medical Sciences, The University of the West Indies, St. Augustine, Trinidad & Tobago acted as ‘Organizing Chairman’ and Dr. Sunita Dahiya, General Secretary APP acted as ‘Chairman Scientific Committee’ during the conference in absentia. Scientific session was initiated with invited lecture of Dr. Raja Abhilash Punagoti, Associate Professor, School of Pharmacy, University of Gondar, Ethiopia who addressed the gathering on ‘Nanomedicine: A Sweet Spot in Fighting Diabetes’. Another lecture was delivered by Dr. Rajasekhara Reddy Sabbasani, Associate Professor,Department of Chemistry, VIT University, Vellore, Tamilnadu on the topic ‘Design and Synthesis of Diversity Oriented Biomolecules for Human Well Being’. Conference was attended by more than 200 delegates all over the state and several papers were presented ‘poster’ session. During the valedictory function, the director of hosting college was conferred with ‘APP Appreciation Award’ by Dr. Suresh V. Chennupati, Vice President, APP Ethiopian International Branch. 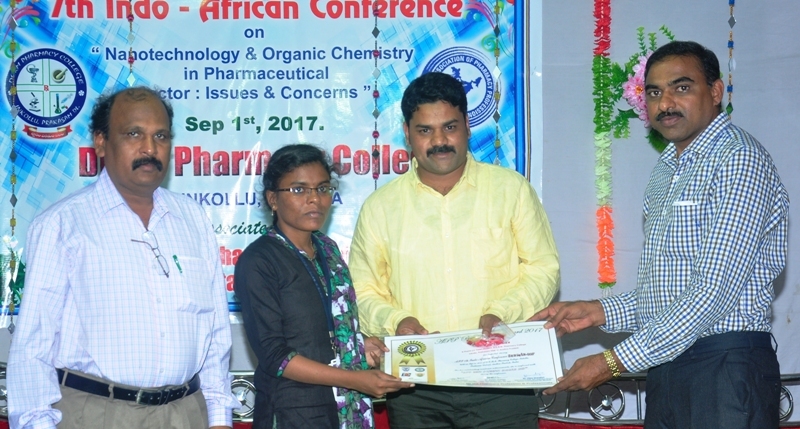 At the end, Ms. P. Mounika, B. Pharmacy student of DCRM Pharmacy College, Inkollu and Mr. A. Kishore Babu, Faculty, DCRM Pharmacy College, Inkollu were conferred with ‘APP Best Student Award’ and ‘APP Best Faculty Award’ by the invited speakers of Indo-African conference. Programme was terminated with vote of thanks. 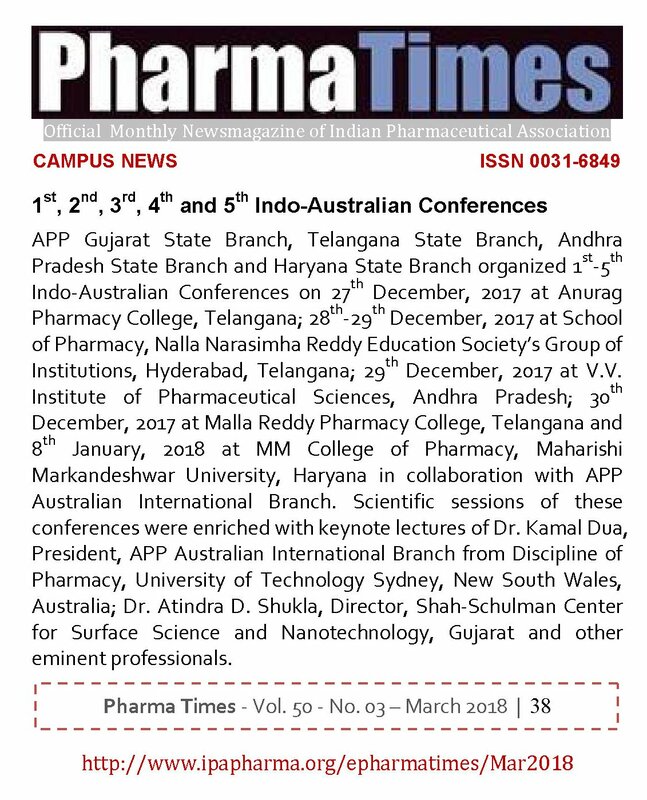 Association of Pharmacy Professionals (APP) Andhra Pradesh State Branch organized 3rd Indo-Australian Conference on “Pharmaceutical Technology: Past, Present and Future Perspectives” on 29th December 2017 at V.V. 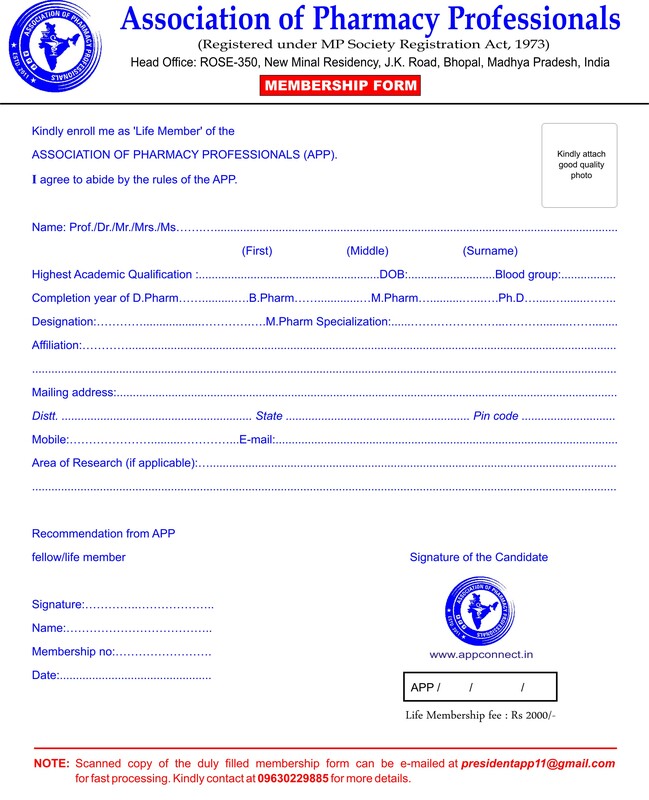 Institute of Pharmaceutical Sciences, Gudlavalleru, Krishna District, Andhra Pradesh in collaboration with APP Australian International Branch. The inauguration ceremony commenced with lighting of lamp by the Chief Guest Dr. Kamal Dua from Discipline of Pharmacy, University of Technology Sydney, New South Wales, Australia and the Guest of Honor Dr. B. Chandra Shekhar Reddy, Principal, Jayamukhi Institute of Pharmaceutical Sciences, Warangal, Andhra Pradesh. Prof. R. Govinda Rajan, Secretary, APP Andhra Pradesh State Branch and Research Director, Hindu College of Pharmacy, Guntur and Dr. S.R.K. 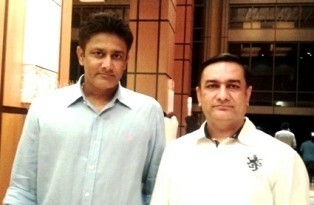 Reddy, Advisor to Management, V.V. 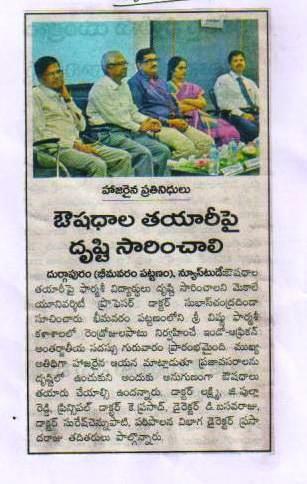 Institute of Pharmaceutical Sciences, Gudlavalleru graced the occasion by sharing the dais. 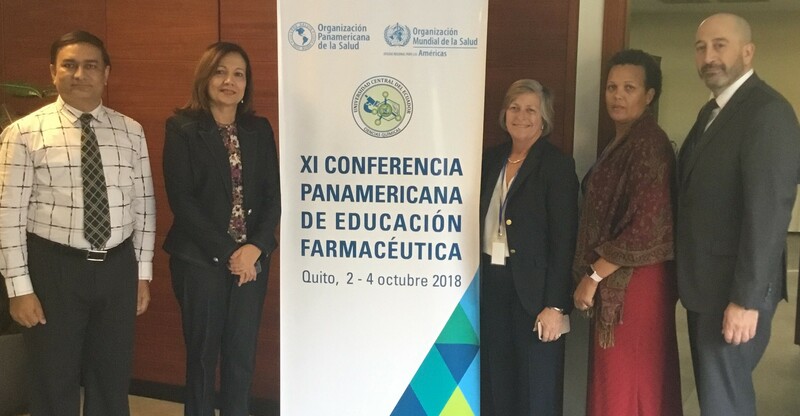 For this scientific conference, Dr. Rajiv Dahiya, Founder President APP and Director, School of Pharmacy, Faculty of Medical Sciences, The University of the West Indies, St. Augustine, Trinidad & Tobago acted as ‘Organizing Chairman‘; Dr. Sunita Dahiya, General Secretary APP from School of Pharmacy, University of Puerto Rico, San Juan, PR, USA acted as ‘Convener‘ and Dr. Suresh V. Chennupati, Vice President, Ethiopian International Branch from School of Pharmacy, Wollega University, Nekemte, Ethiopia acted as ‘Scientific Committee Chairman‘. 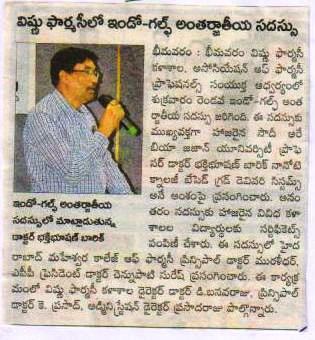 The Convener and Principal of the college Dr. A. Lakshmana Rao welcomed the resource persons and delegates. 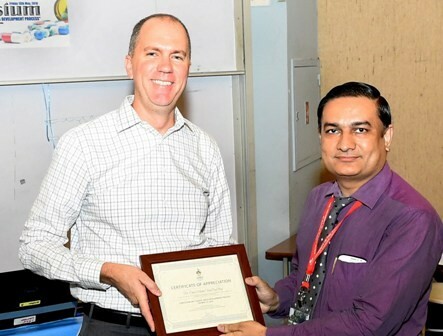 Later, the CD containing scientific abstracts was released by the Chief Guest from University of Technology Sydney, Australia. 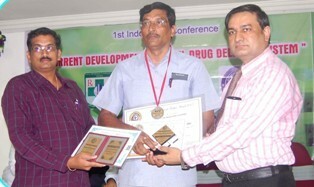 The scientific session of the conference was enriched with plenary lectures of Dr. Kamal Dua and Dr. B. Chandra Shekhar Reddy on topics of pharmaceutical interest like “Various Hydrophilic Carriers: Catalyst for Solubility Enhancement of Poorly Water Soluble Drugs” and “Understanding the Role of Preformulation in Drug Development”. In the afternoon scientific session, about 100 research and review papers were presented in several sections. 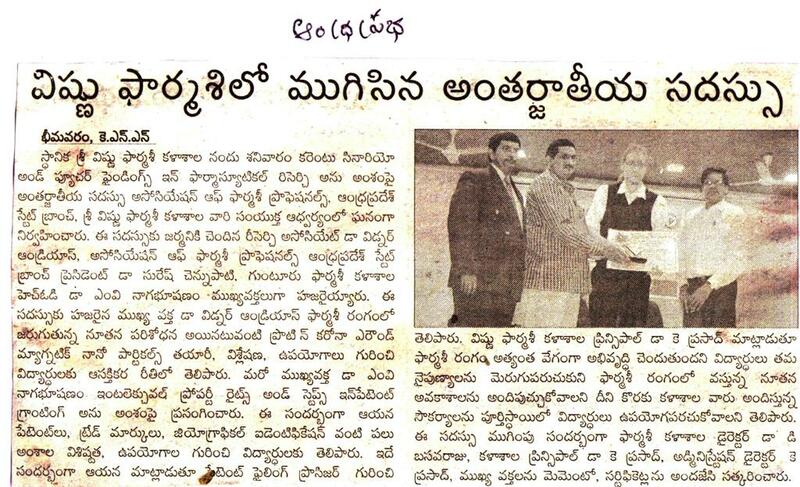 Dr. P. Naga Raju from Hindu College of Pharmacy, Guntur; Dr. G. Vijay Kumar, Dr. T. P. Rao from K.V.S.R. 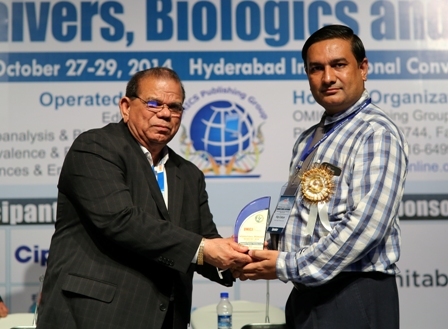 Siddhartha College of Pharmaceutical Sciences, Vijayawada and Dr. A. Ajay Babu from M.A.M. 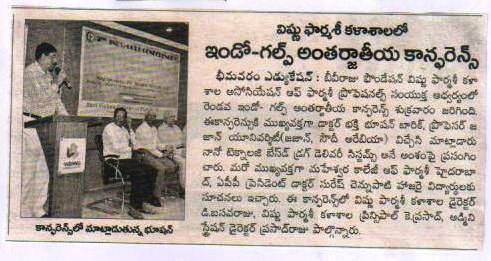 College of Pharmacy, Narasaraopet were the judges for the scientific session. In pharmacology section, Ms. Aishwarya and Finian from Adithya College of Pharmacy, Surampalem won first prize in oral presentations and second prize in poster presentations. In pharmaceutical analysis section, Ms. K. Jyothi from Hindu College of Pharmacy, Guntur and Mr. S. Shakir Basha from Sri Vidhyanikethan, Tirupati won first prize in oral and second prize in poster presentations. 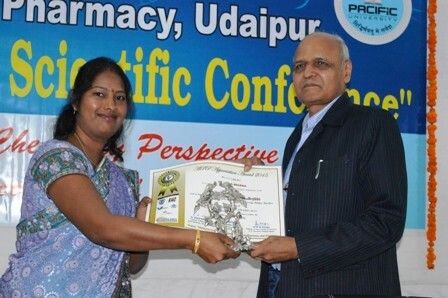 In pharmaceutics section, Ms. Nihitha Sanka from Chalapathi Institute of Pharmaceutical Sciences, Guntur and Ms. D. Dharani Srividya from Vijaya Institute of Pharmaceutical Sciences for Women, Vijayawada won first prize in poster and oral presentations and Mr. Ch. 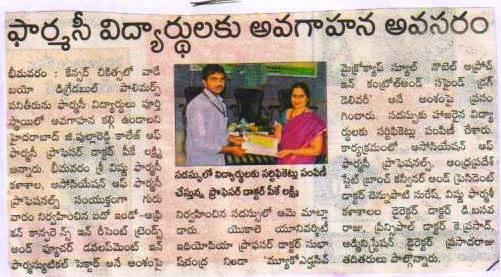 Shiva Gopal from V. V. Institute of Pharmaceutical Sciences, Gudlavalleru won second prize in poster presentations. In pharmaceutical chemistry section, Mr. Vikram Choudhary from Srinathji Institute of Pharmacy, Rajasthan and Ms. V. Dhilekha from VJ’s College of Pharmacy, Rajahmundry won second prize in oral presentations. 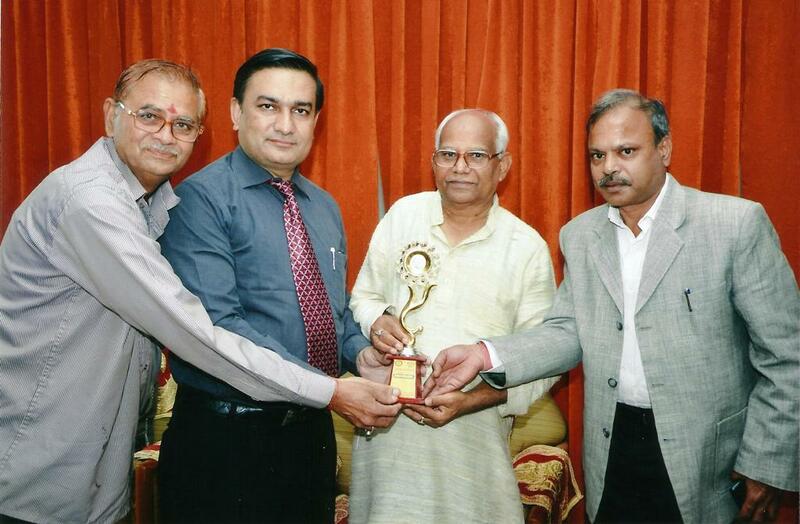 During the valedictory function, ‘APP Best Faculty Award’ was provided to Dr. Sk. 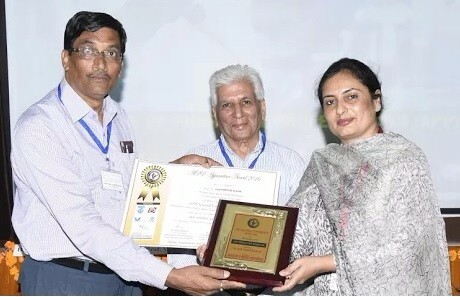 Amina Bee, Associate Professor, Department of Pharmacology, VVIPS, Gudlavalleru; ‘APP Best Researcher Award’ to Dr. P. Bharghva Bhushan Rao, Associate Professor, Department of Pharmaceutics, VVIPS, Gudlavalleru; ‘APP Best Student Award’ to Ms. Lakshmi Sindhu Atluri, B.Pharm Student, VVIPS, Gudlavalleru; ‘APP Appreciation Award’ to Dr. V. Nageswara Rao, Chairman, VVIPS, Gudlavalleru and ‘APP Recognition Award’ to Dr. A. Lakshmana Rao, Principal, V.V. Institute of Pharmaceutical Sciences, Gudlavalleru. Speakers of the conference were felicitated with ‘Certificates of Recognition‘ by the convener during the valedictory function. The program ended with vote of thanks and concluded with national anthem. 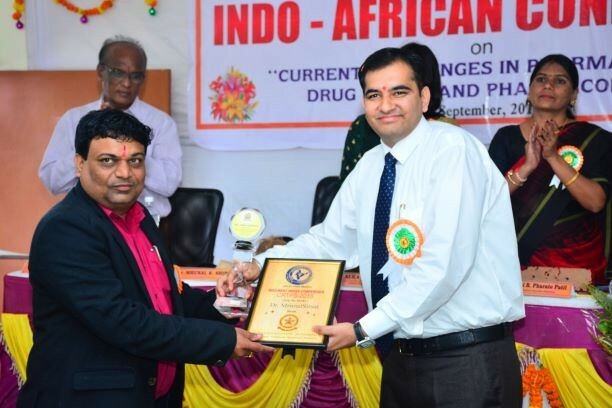 Association of Pharmacy Professionals (APP) Ethiopian International Branch and APP Andhra Pradesh State Branch jointly organized 13th Indo-African Conference on ‘Advances in Pharmaceutical Sciences and Technology’ on 7th September, 2018 at Vijaya Institute of Pharmaceutical Sciences for Women, Enikepadu, Vijayawada, Andhra Pradesh on the occasion of ‘Paryushan Parva’. The scientific event was witnessed by Sri B. S. Appa Rao, Chairman, SRK Foundation, Vijayawada, Andhra Pradesh as ‘Chief Patron’; Dr. K. Padmalatha, Principal, Vijaya Institute of Pharmaceutical Sciences for Women, Vijayawada and Dr. Sunita Dahiya, General Secretary APP from Department of Pharmaceutical Sciences, School of Pharmacy, University of Puerto Rico, San Juan, PR, USA as ‘Conveners’; Dr. Suresh V. Chennupati, Vice President, APP Ethiopian International Branch from Wollega University, Ethiopia as ‘Co-convener’; Dr. Subas Chandra Dinda, President, APP Ethiopian International Branch from Mekelle University, Ethiopia and Dr. Sudhakar Sagaram from Wollega University, Ethiopia as ‘Guests of Honor’. 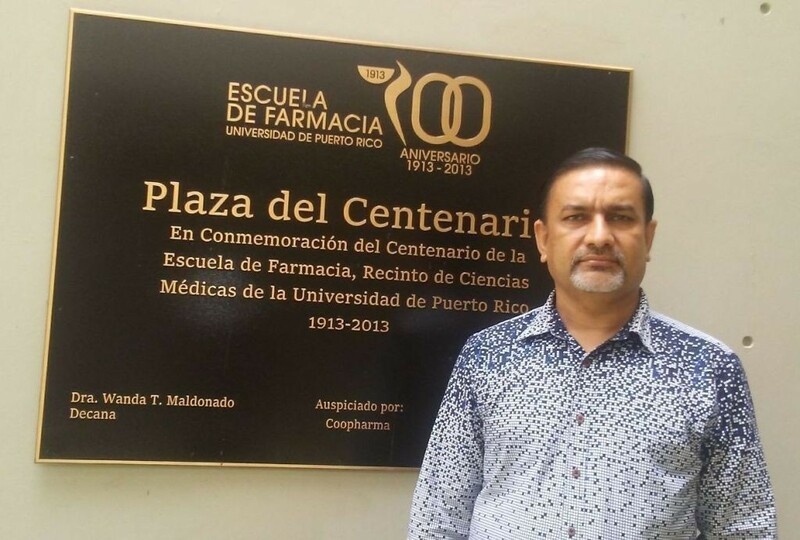 Further, Dr. Rajiv Dahiya, Founder President APP and Director, School of Pharmacy, Faculty of Medical Sciences, The University of the West Indies, St. Augustine, Trinidad & Tobago acted as ‘Scientific Committee Chairman’ in absentia. Inauguration started with ‘Prayer’ followed by welcome of all the guests on the dias with bouquet of flowers. Scientific session was initiated with lecture of Dr. Subas Chandra Dinda, Professor, Department of Pharmaceutics, School of Pharmacy, College of Health Sciences, Mekelle University, Mekelle, Ethiopia who addressed the gathering on ‘Nanotheranostics and Its Toxicity Concerns in Drug Targeting’. 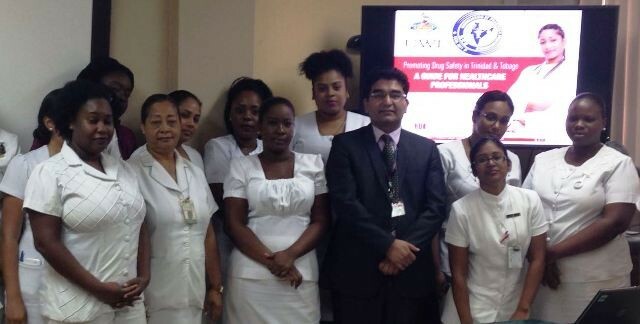 Another lecture was delivered by Dr. Sudhakar Sagaram, Associate Professor, Department of Pharmacy, College of Medical and Health Sciences, Wollega University, Ethiopia on the topic ‘Indian Pharmaceutical Industry and Its Potential in Term of Opportunities and the Challenges of Data Management’. Session was terminated with lecture of Dr. A. Lakshman Rao, Principal & Professor, V.V. 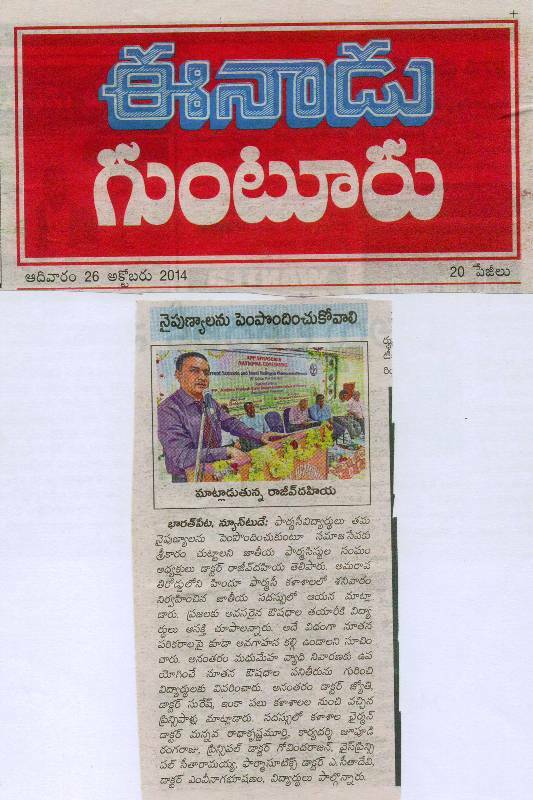 Institute of Pharmaceutical Sciences, Gudlavalleru on the topic ‘Natural Product Based Research: A Promising Outcome’. During the valedictory function, Chairman, SRK Foundations, Vijayawada and Principal, Vijaya Institute of Pharmaceutical Sciences for Women, Vijayawada were conferred with ‘APP Appreciation Awards’ by Dr. Suresh V. Chennupati, Vice President, APP Ethiopian International Branch. 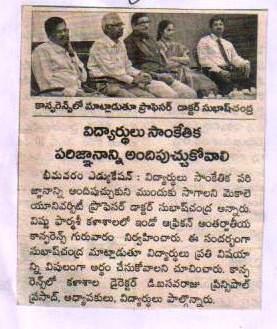 At the end, Prof. A. Lakshman Rao, Principal, V.V. 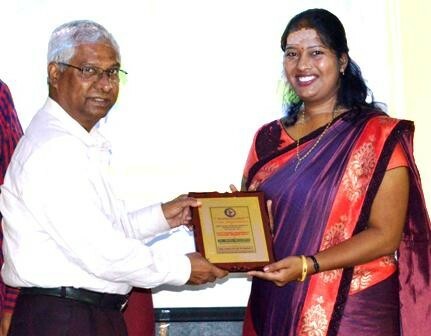 Institute of Pharmaceutical Sciences, Gudlavalleru was honored with ‘APP Principal of the Year Award’ for his overall outstanding performance in administration, academic and research activities by Prof. S. C. Dinda, President, APP Ethiopian International Branch and Ms. Veeramachineni Padma Sri, B. Pharm student of Vijaya Institute of Pharmaceutical Sciences for Women was conferred with ‘Best Student Award 2018’ by Dr. S. Sagaram from Wollega University, Ethiopia. Programme ended with vote of thanks by Dr. S. Sundar, Associate Professor from the hosting institute.